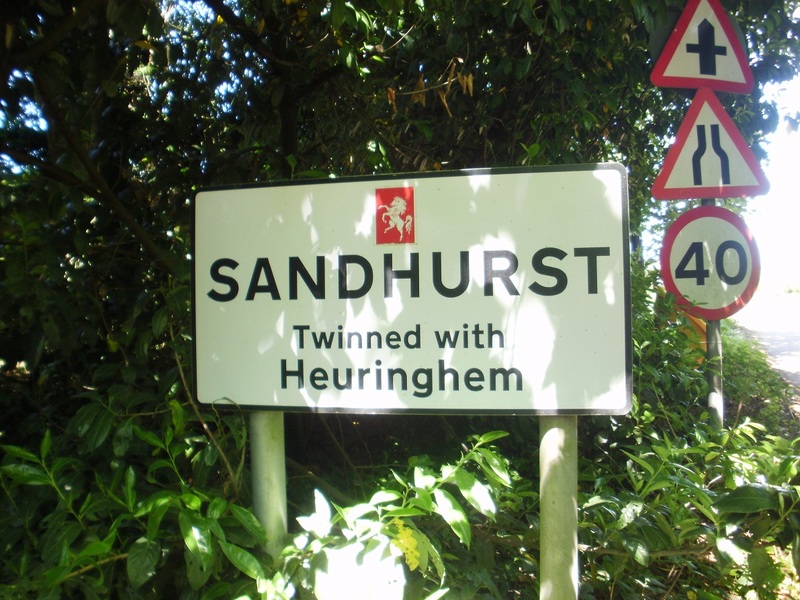 When we decided to walk between the Sandhursts (and this included the Sandhurst (Berks) to Sandhurst (Kent) route we undertook last year), we wanted to avoid, as much as possible footpaths we had walked previously. 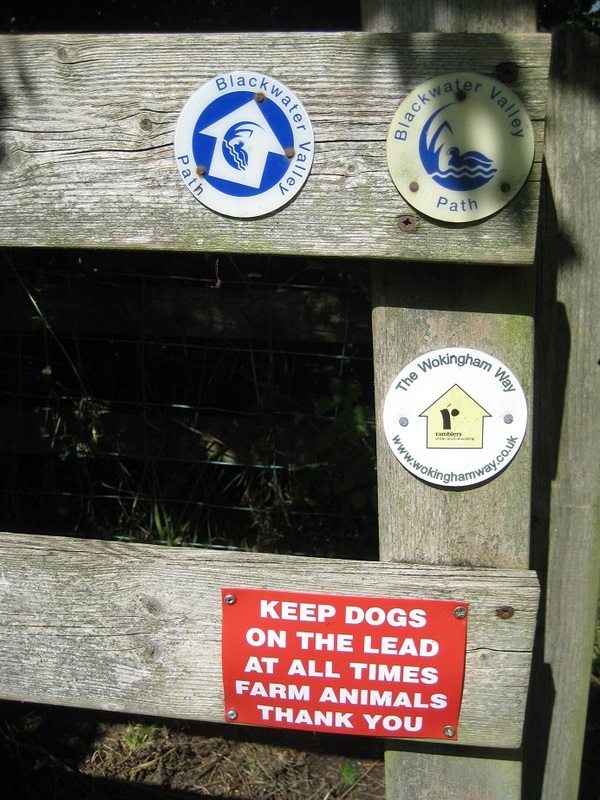 We ‘broke’ this rule a couple of times of the Berks-Kent section as we had to walk on footpaths near our home. Today was the first time on the Gloucs-Berks section we were to repeat a route. The first mile was on the Thames Path. A long distance path we walked back in 2015. 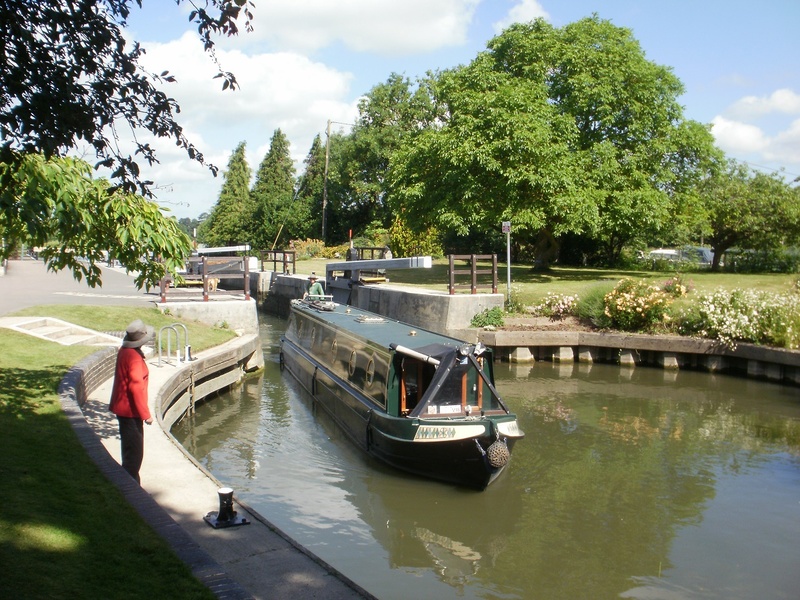 Today we started at St John’s Lock, Lechlade which we visited back in March 2015. Then the lock-keeper was busy painting the locks for the Easter season, today there was no sign of the lock-keeper – instead a couple of boat owners using the lock. 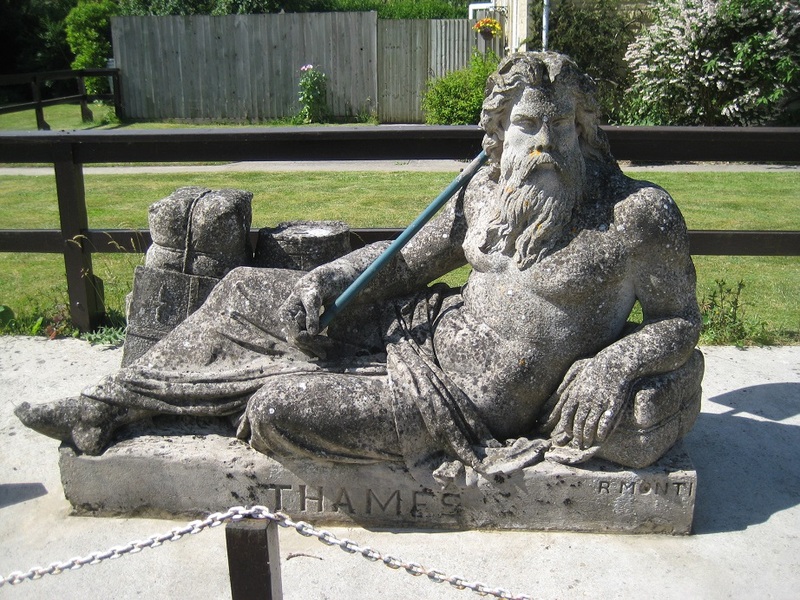 Old Father Thames looked on as always. The Head of Navigation is only a couple of miles upstream so this is one of the least used locks on the river – and yet at 10 o’clock on a warm Friday morning we saw three boats! A rare event … a boat leaving St John’s Lock ! Our route took us downstream along the river to Buscot. The route, and caches, hadn’t changed much in 3 years so we had nothing new to find. We reminisced about our walk in 2015, as we crossed an ever-so-slightly-too-large bridge, examined in detail a WW2 pill-box guarding the river, and tried to remember a couple of the hiding places where we found caches. Before entering the National Trust village of Buscot we turned off onto a footpath (least ways, we missed the footpath at first and then returned to it once we realised our error). 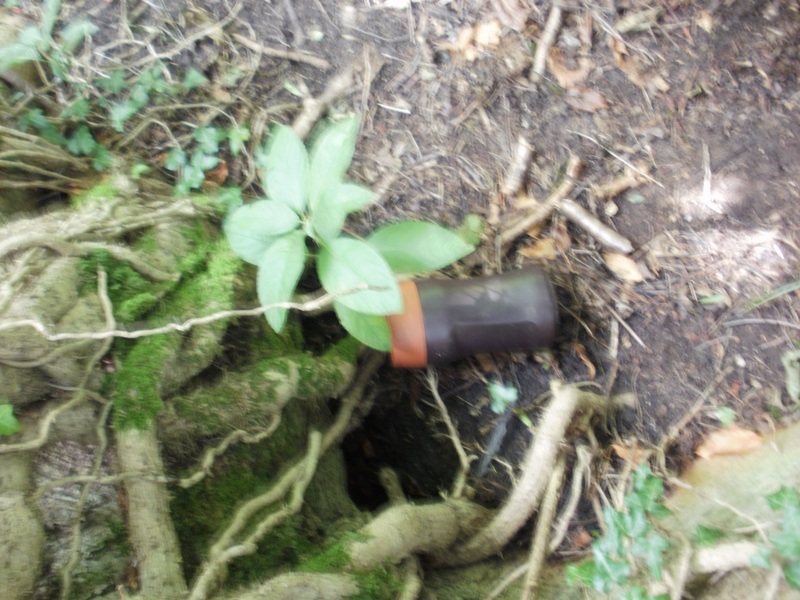 Here we quickly came across our first find of the day – a tube wedged in an old, hollow tree-trunk. 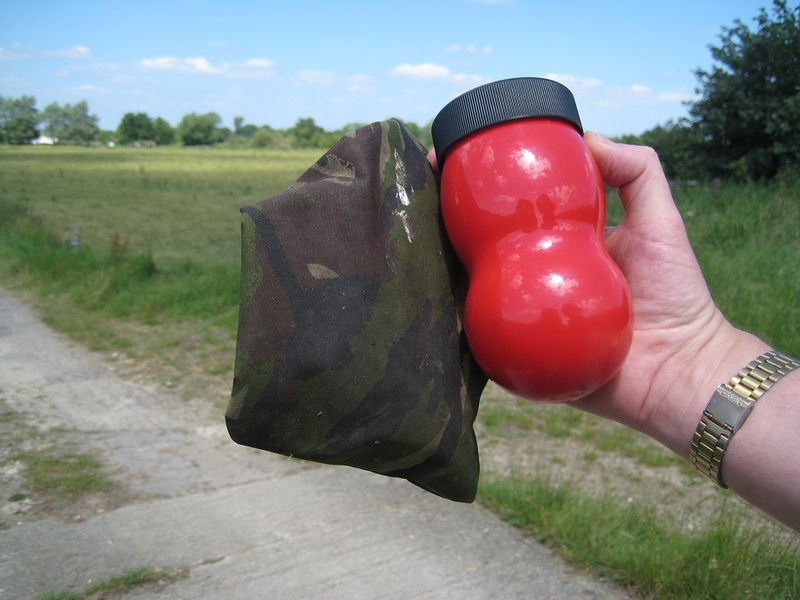 The caching is easy…but the footpath is hard work! From then the finds were relatively straightforward. 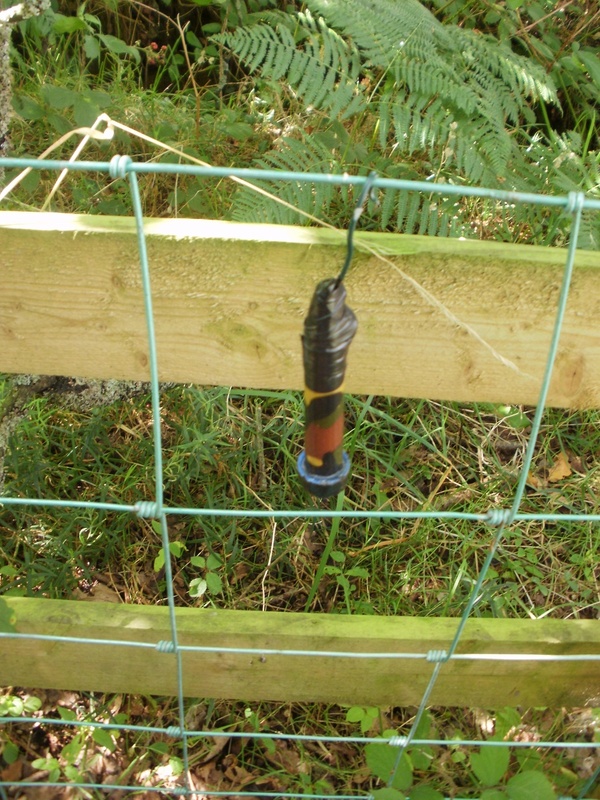 Sometimes the caches were ‘hanging’ from a wire fence, sometimes a false rock between posts. On another occasion, underneath some very prickly brambles. 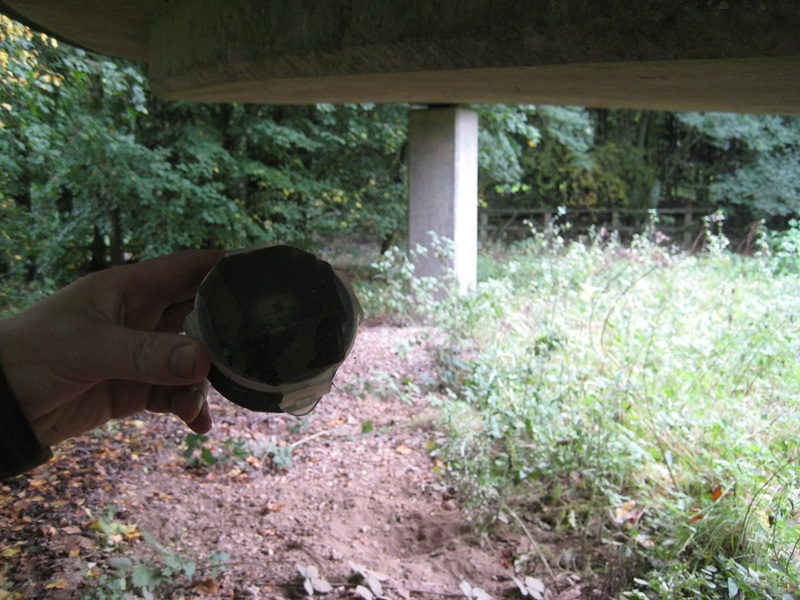 The footpath had taken us away from the river and towards the busy A417 (another cache under some heavy concrete). At this point we turned away from the road and headed, at an acute angle, back to the river. 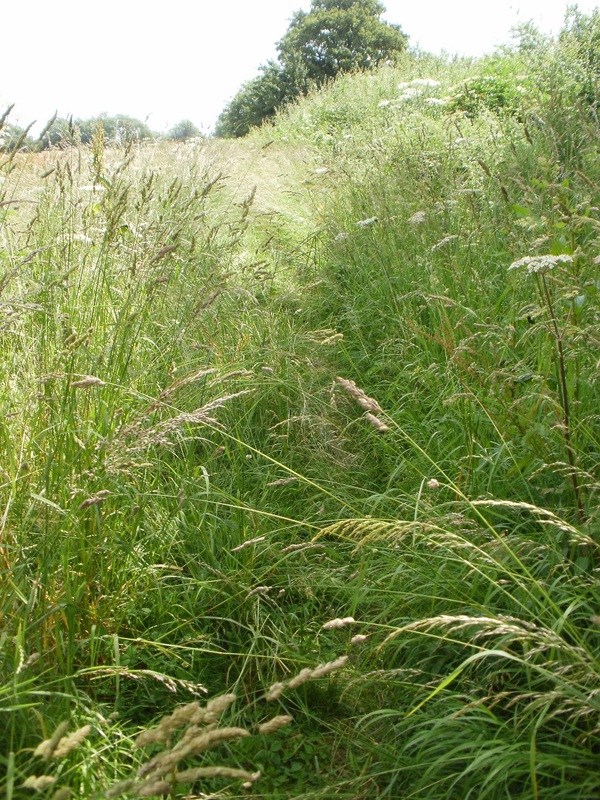 We crossed a newly-mown hay field with a barely distinct footpath through it. 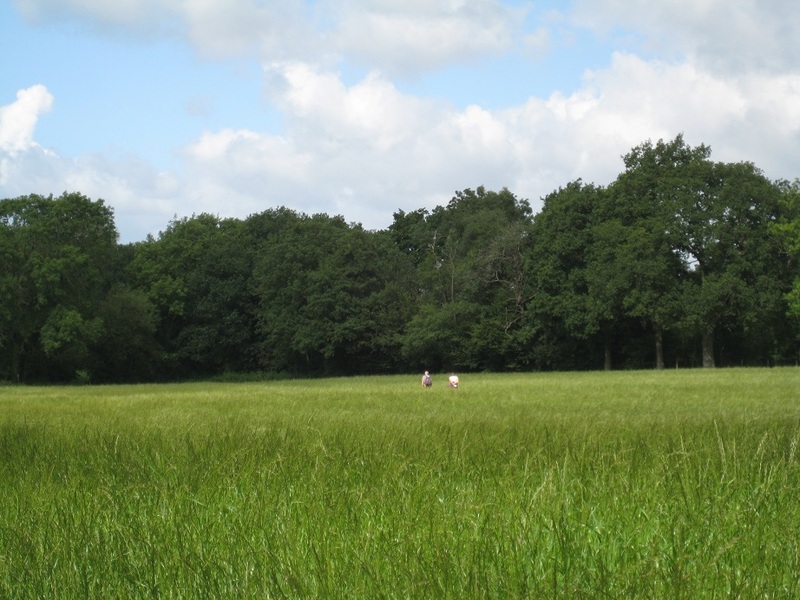 As we crossed through the field, we noticed two ramblers walking AROUND the field boundary. Should we have done that? Were they cachers ? 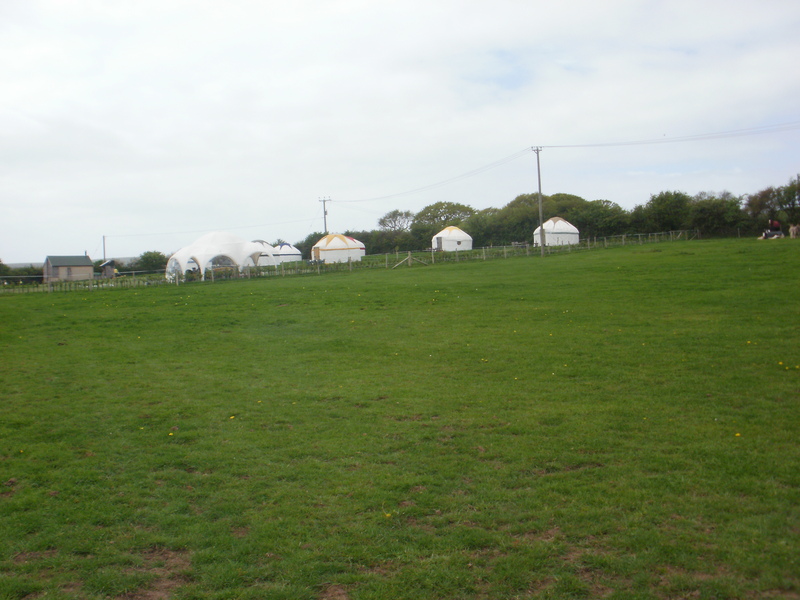 We arrived at our exit point of the field and looked back. We had missed the footpath by 10 feet (whoops!) and the ramblers…were genuine ramblers as they made no effort to find our previous find. 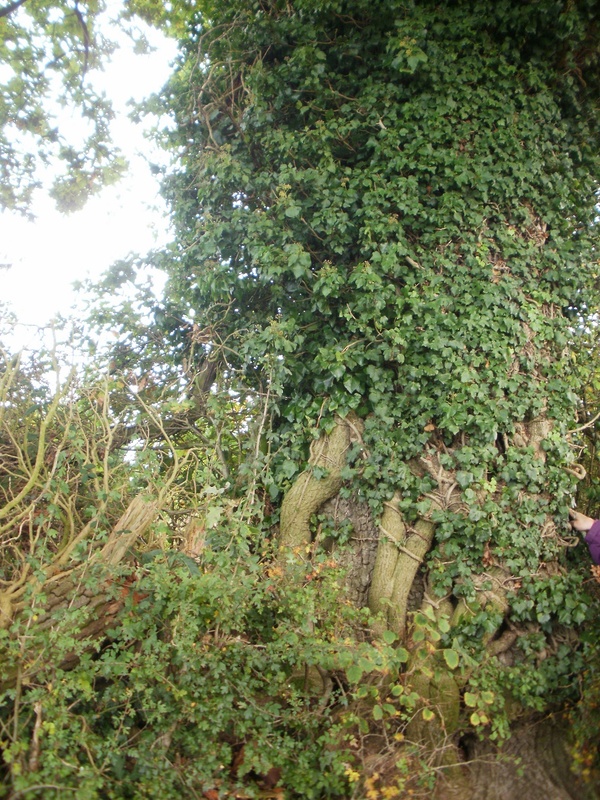 A couple more caches followed (more brambles) and then a highlight cache of the walk. An ammo can. Most large ammo cans we have found have been placed on the ground, but this one had the hint of ‘chest high on a fallen branch’. And it was! Covered with stickoflage, but hidden wedged in tree branches. It’s not often one finds an ammo can, especially on a newish series (just over 3 years old). The hiding place and caches had been straightforward but different. 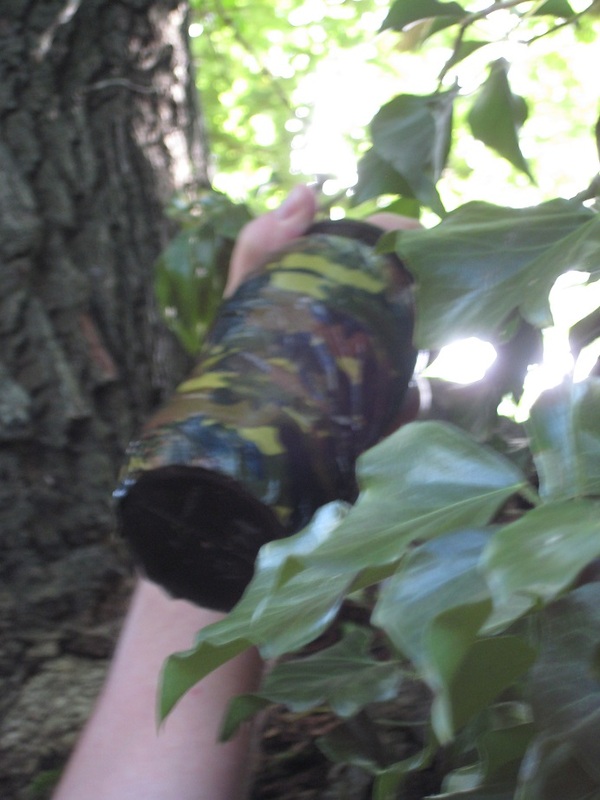 It is all too easy to place a film canister under a stone behind a tree, but Mashcast, the cache owner of the Buscot Bunker Bimble (BBB) series, had given thought to different hiding places, and hidden appropriate and different containers. 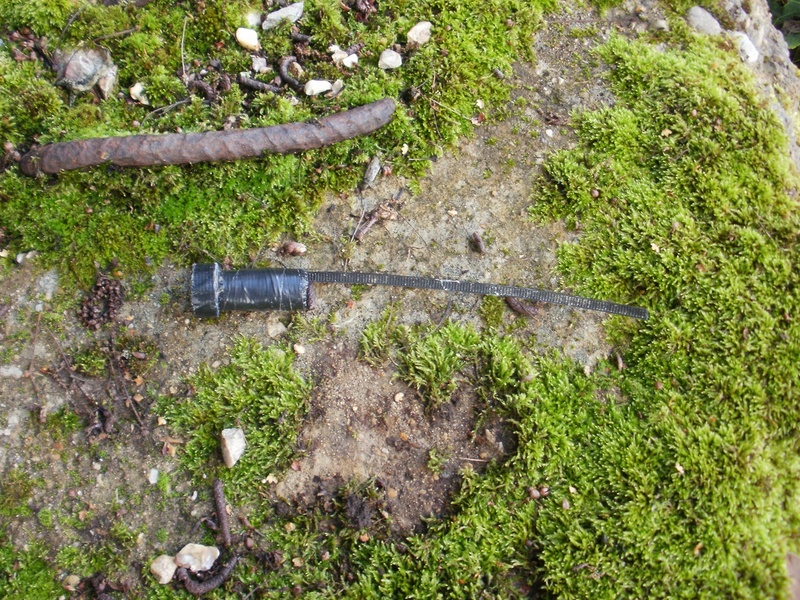 Our last three finds were under some pipes, another wire dangler, another wedged in a hedge. Before our path took as back the A417, we had lunch overlooking the river. A varied few minutes as we munched our sandwiches. 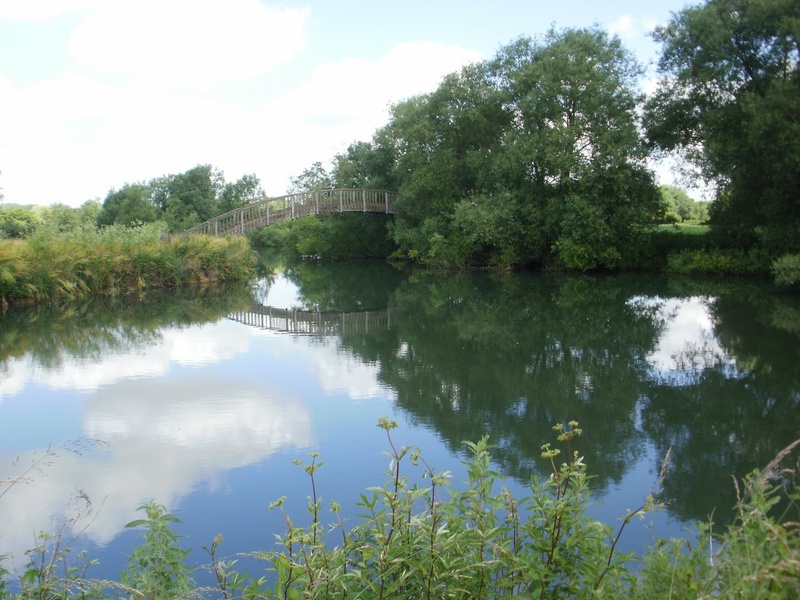 A few ramblers went by, a couple of planes took off noisily from nearby Fairford Airfield, and then – just as we were about to leave – two kingfishers appeared. We think it was a parent feeding a youngster, but within seconds both birds had disappeared. We readied our cameras and waited to see if they would reappear – sadly, our wait was in vain. 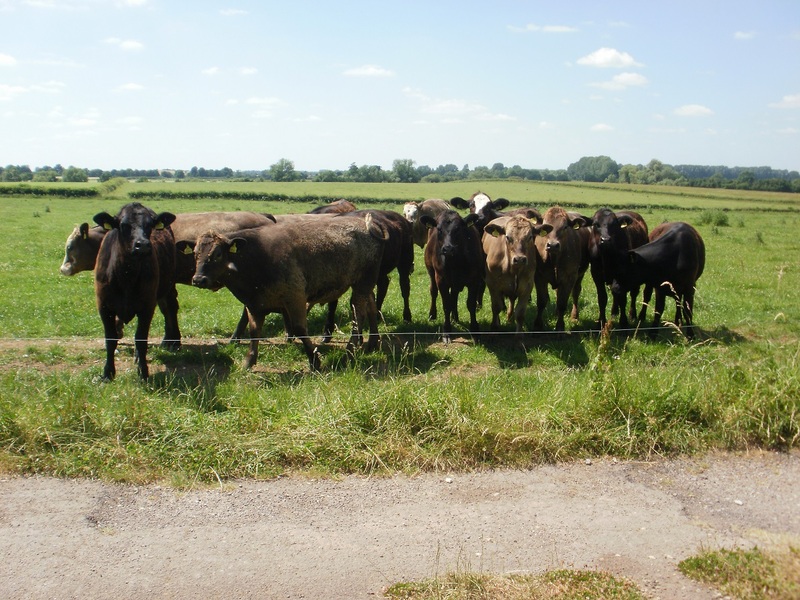 Moo-ve along now, moo-ve on..
Our last 2-3 miles of the day had just one cache on the route, near our car at Badbury Clump. And, of all the sections of our Sandhurst Trail, this was one of the least interesting. We were walking the d’Arcy Dalton Way, names after Colonel d’Arcy Dalton who campaigned for and preserved rights of way in Oxfordshire. 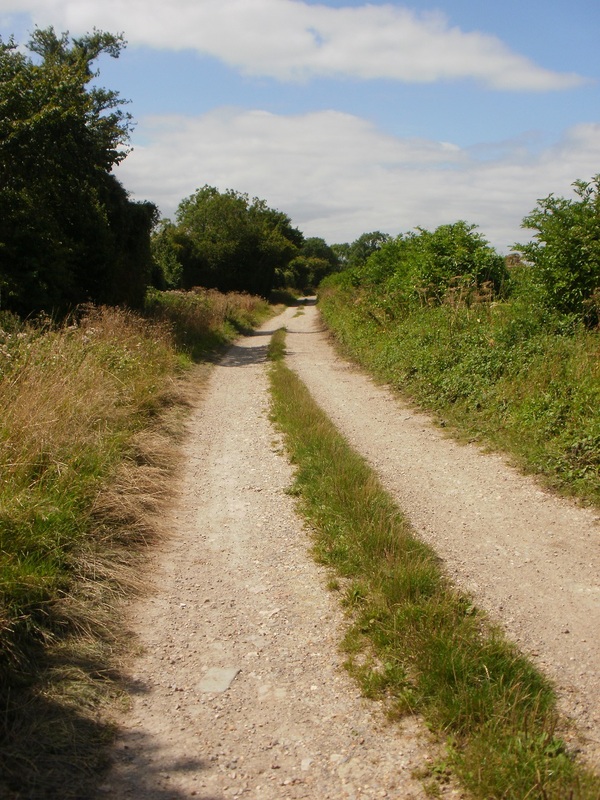 This trail links two long distance paths in North Oxfordshire (Oxford Canal Walk, Oxfordshire Way) with two paths in the South of the county (the Thames Path and the Ridgeway). 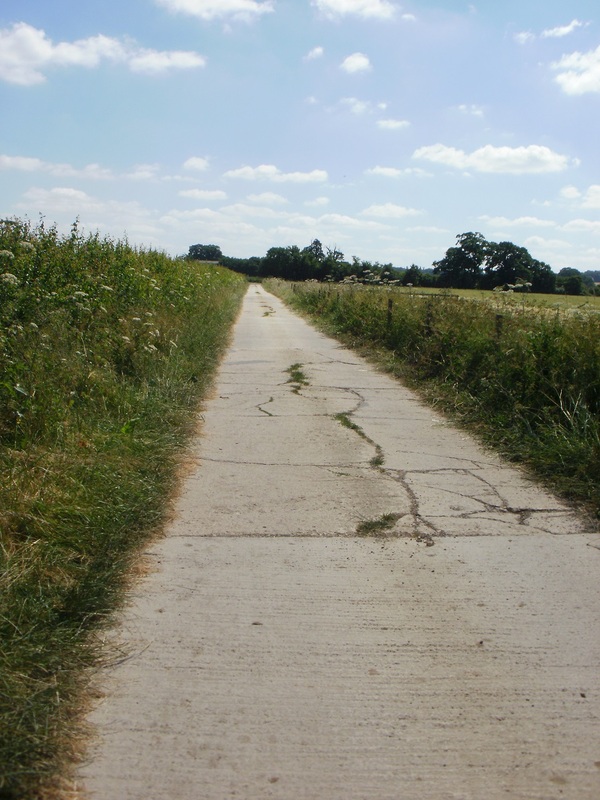 The section consisted of relentless tarmac leading up to two farms. As we walked through the second of the farmyards we were greeted in Orwellian tones with ‘We are watching you, we are watching you, we are watching you’ – we had set off the security cameras! The farmer, though, was out in the fields, spraying crops, and we paused to ensure we weren’t sprayed too, as we started our ascent up Badbury Clump. Many paths criss-cross the Clump and we wanted to make sure we took the correct one. Fortunately for us a rambler appeared from nowhere as we approached a junction of paths. He started to descend, we got chatting, and he realised he shouldn’t have gone downhill to meet us! We though had gleaned where a contouring footpath was, and walked the 300 yards to the cache. 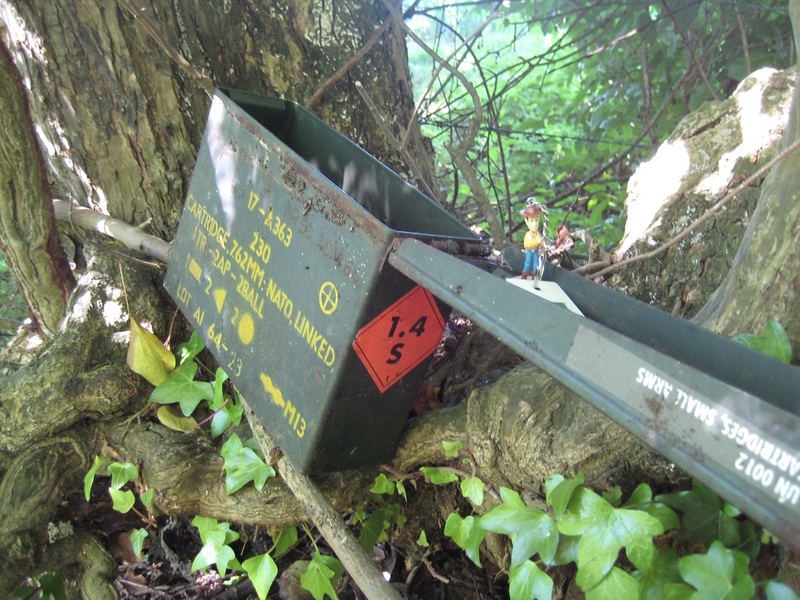 Imagine our surprise to find…another ammo can! Our second of the day ! We have never found two ammo cans in the same day! Whoop! Whoop! 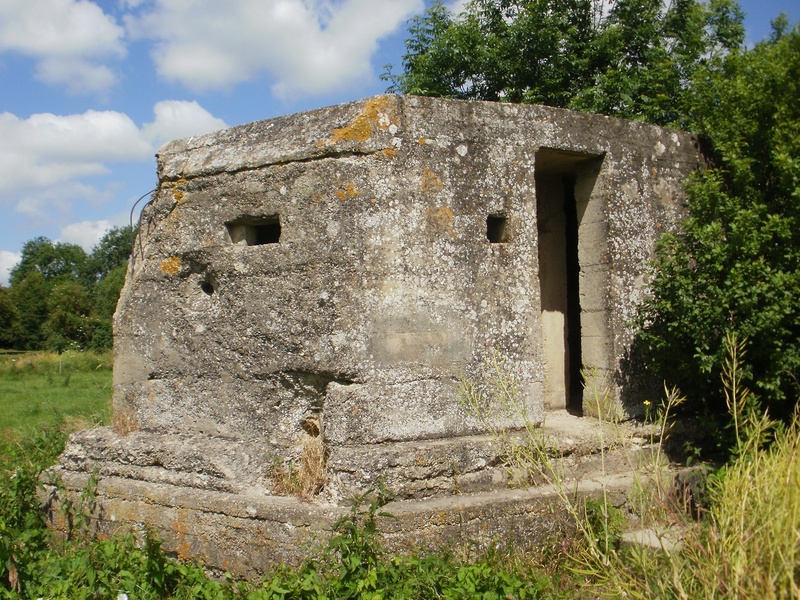 Another ammo can…and a very useful Womble! Inside though amongst the goodies and swaps, was a Womble. (We then realised the cache owner was The Wombles). 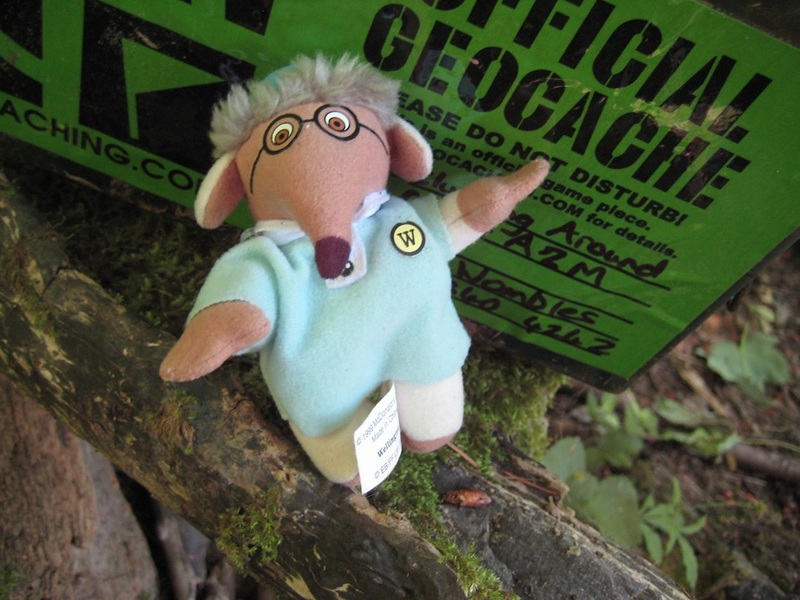 The Womble had some coordinates attached…it was the Westing Co-ordinates for the Wombles Signature Cache. 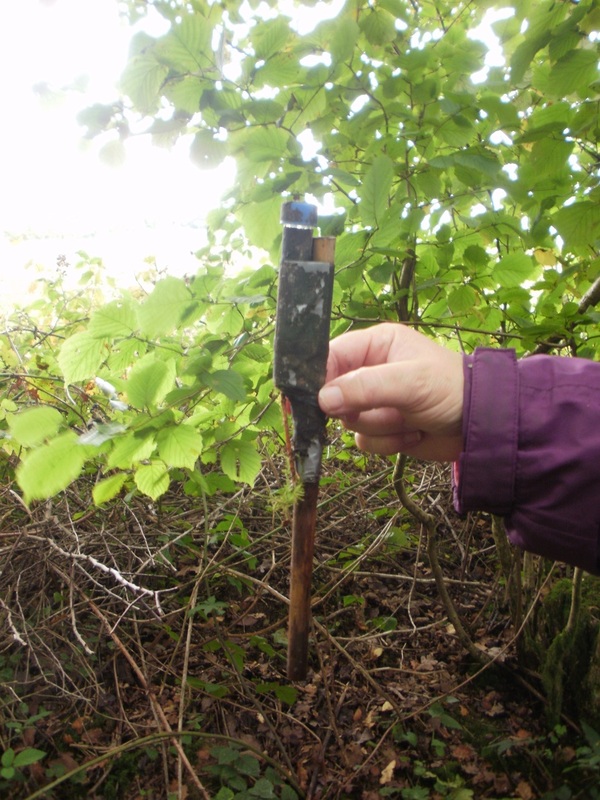 we had the Northing Co-ordinates from another Womble as it is in our own cache, in Berry Bank Copse! We had all the information for find the Signature Cache! Wowser! We took loads of photos, and wrote the co-ordinates in triplicate. We really didn’t want to lose these magic numbers. 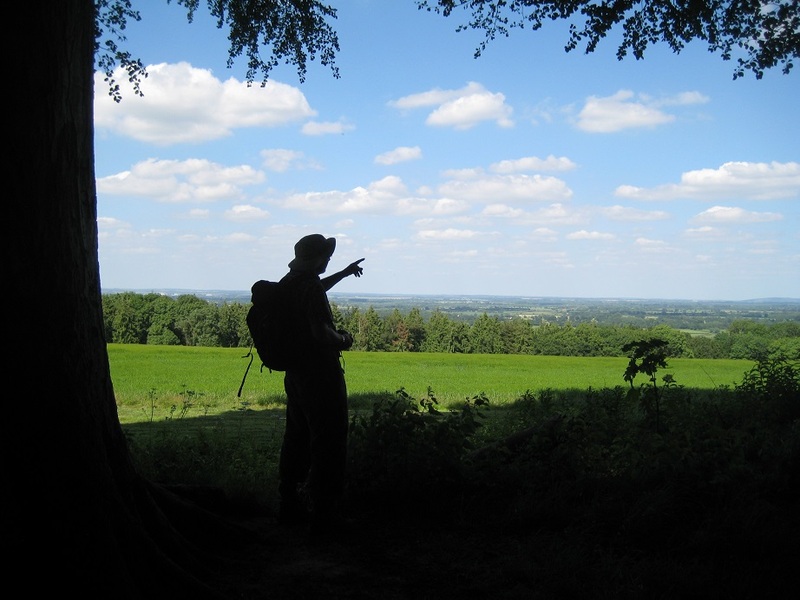 Then a short walk followed over the crest of Badbury Clump to the car park. Badbury Clump, a former Iron Age Hill fort, has fine views over the Oxfordshire landscape and is allegedly where King Arthur defeated the Anglo-Saxons! We had no fighting today – just good memories of a double-ammo-can day ! It had been some weeks since our last all-day geocaching expedition, and with Autumn taking hold, the Popham Perambulation seemed an ideal route to complete before the weather and daylight succumbed to Winter. Popham is a small village just outside of Basingstoke near to both the M3 and A30. It has an airfield though we only saw one aircraft all day and that was at lunchtime. 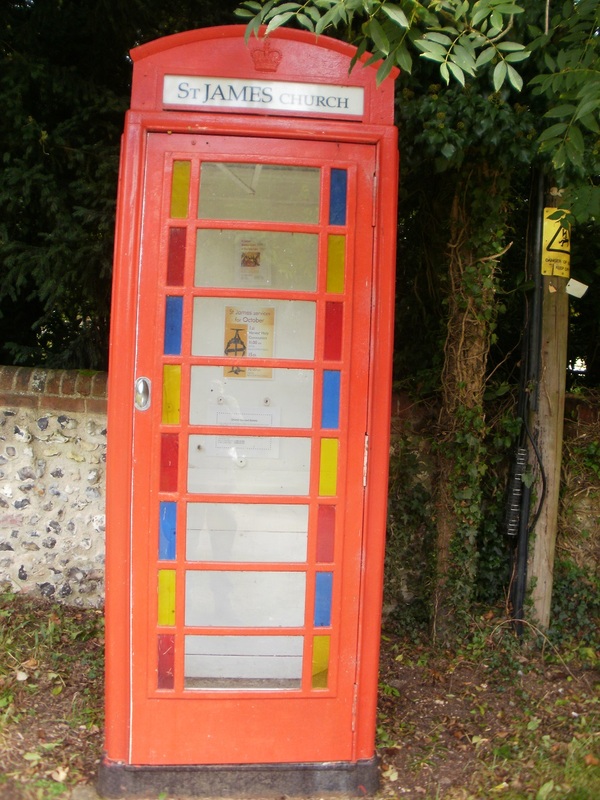 The Perambulation circuit consists of 16 caches, a bonus cache (based on numbers collected from caches along the way), and also a Church Micro: 18 caches, 5 miles. 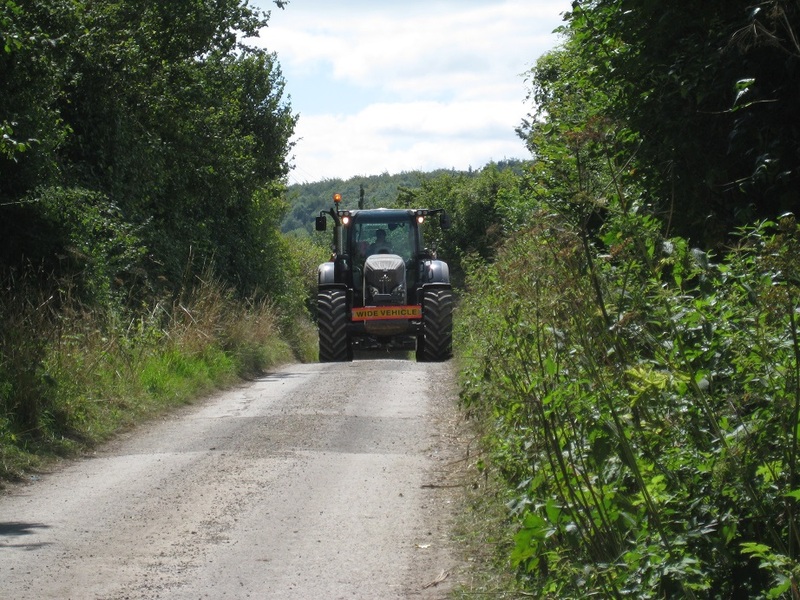 The route took us around farmland – we must have gone round at least half a dozen fields, many of which had boundary hedgerows (ideally hiding places!). The route also crossed through several small copses (again ideal caching locations). While we were on route to cache 1 we were aware of several vehicles driving into the first farm. What were they going to ? What is that vehicle doing ? It was only much later we saw lots of pheasants (doing a good guard job over a cache) and heard guns firing. Then, we realised our route was close to a day’s shoot. Indeed while we were attempting caches 14, 15, and 16 the shooting party were preparing to shoot within yards of where we were looking. Minutes later and we would have been in the firing line! Phew ! The numbers that we needed to find the bonus cache had been placed in various caches on route. 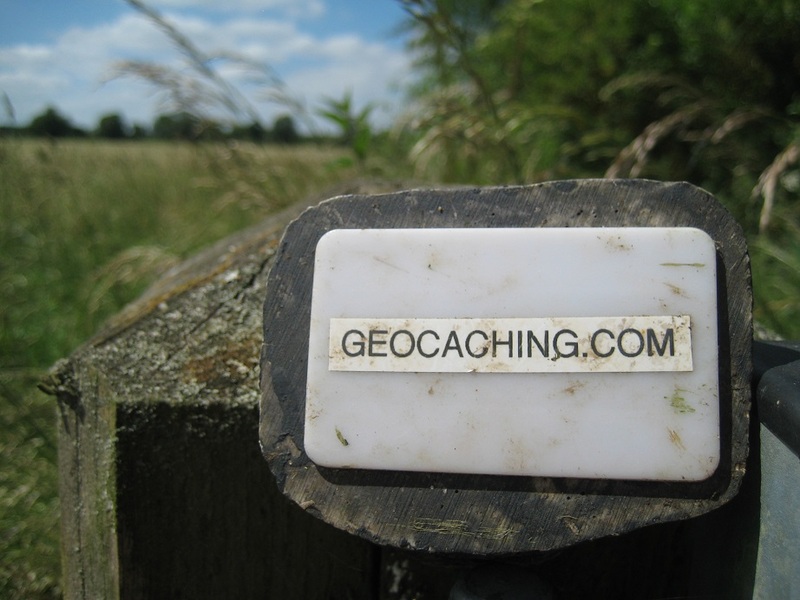 We were grateful that the numbers were duplicated in various caches, as we failed to find 4 of the 16 caches! Two of these DNFs were in ivy and after 10-15 minutes searching we gave up at each location. 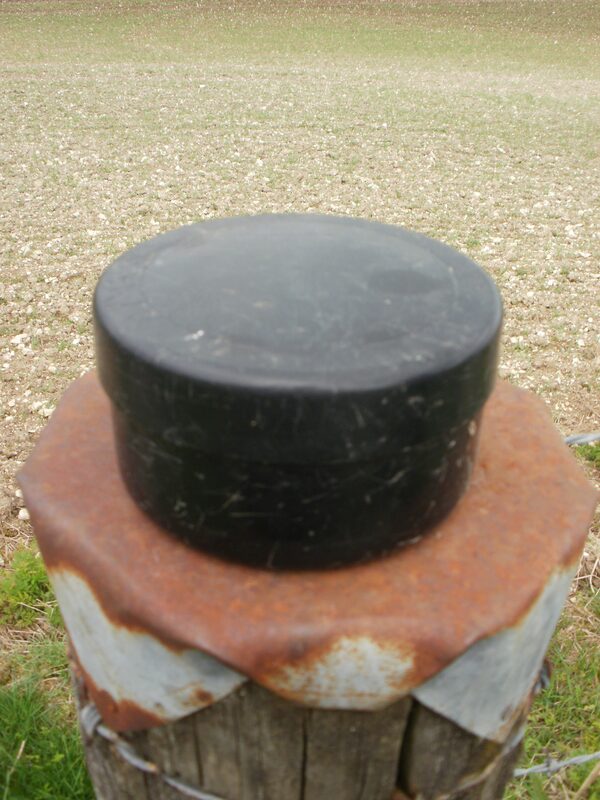 Another of our DNFs had genuinely gone missing and has subsequently been replaced. 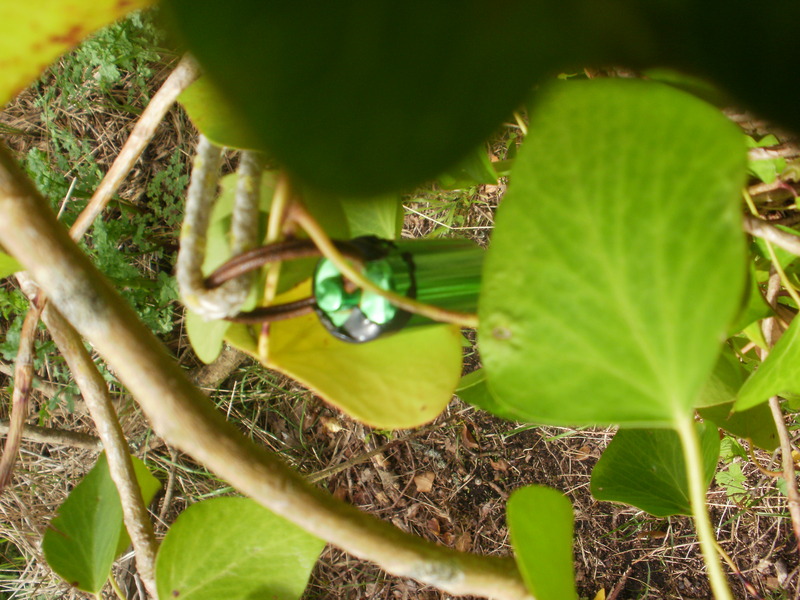 Somewhere in the ivy, is a cache. Sadly we didn’t find it! 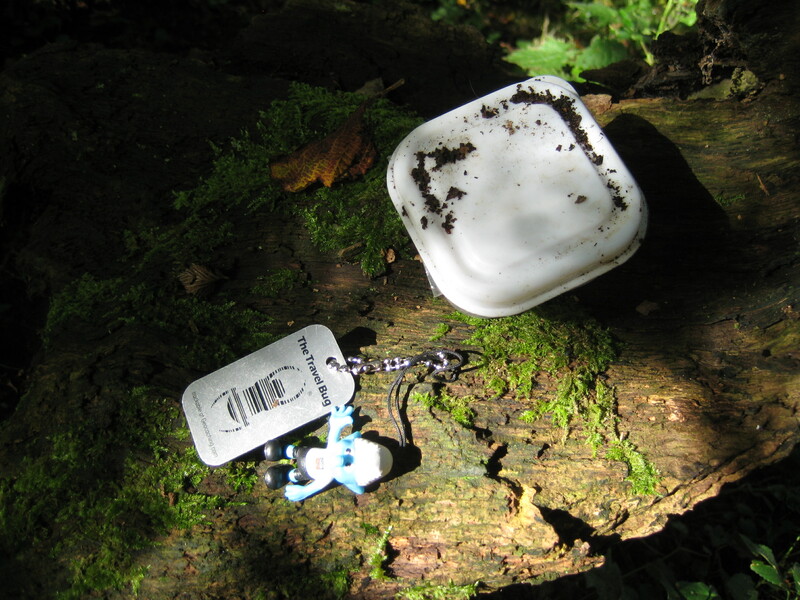 Many of the caches we found were relatively small and it took us a few cache finds until we found a cache big enough to fit the Schlumpfi trackable inside. The Church Micro was an easy find, as it was out in the open, so we hid it better. Our only disappointment was that the Church was closed, presumably for the following day’s Harvest Festival. The Church did have an unusual way of displaying parish notices! The Church seats were an ideal place to have lunch, and it was here a light aircraft flew overhead, towing a banner advertising Winchester shopping centre! After cache 16 we checked the numbers we had found, and discovered more by luck than judgement, our car was parked a few yards from the final hiding place. Our plans today were the Farley Forage series and a couple of other caches on route. 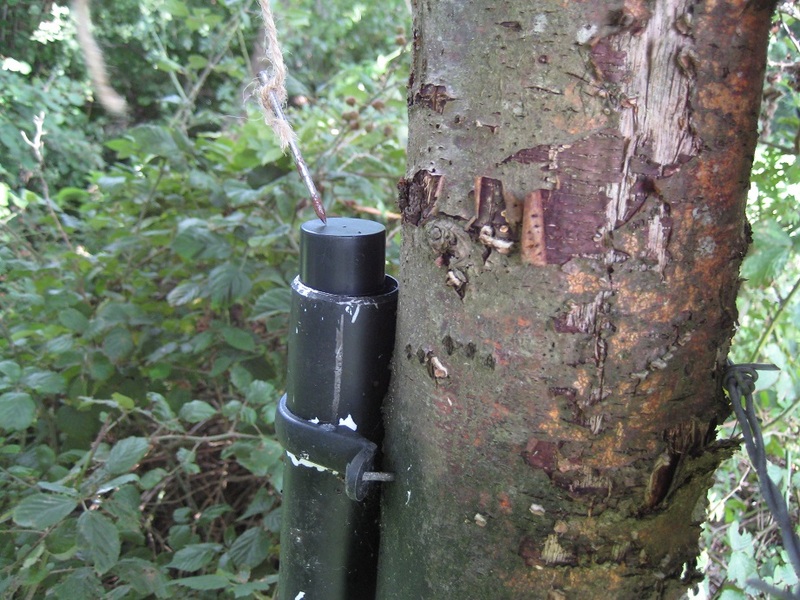 The caches were ‘squeezed’ between two other series we had completed recently – the Hampshire Drive By, and the Cache-as-Cache-can series in Farley Hill. 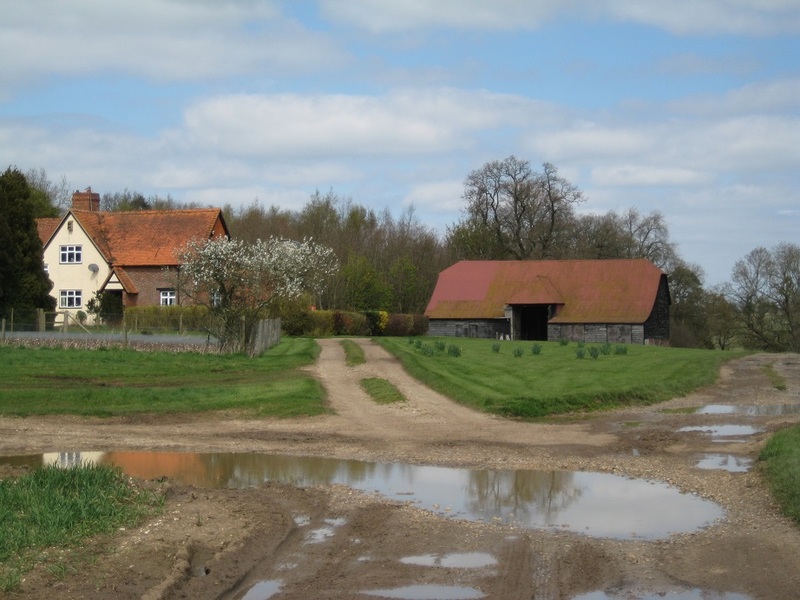 The Farley Forage series was wholly in Berkshire, but due to quirkiness of the roads – and a troublesome (vehicle) ford crossing of the River Blackwater, we parked in Hampshire. 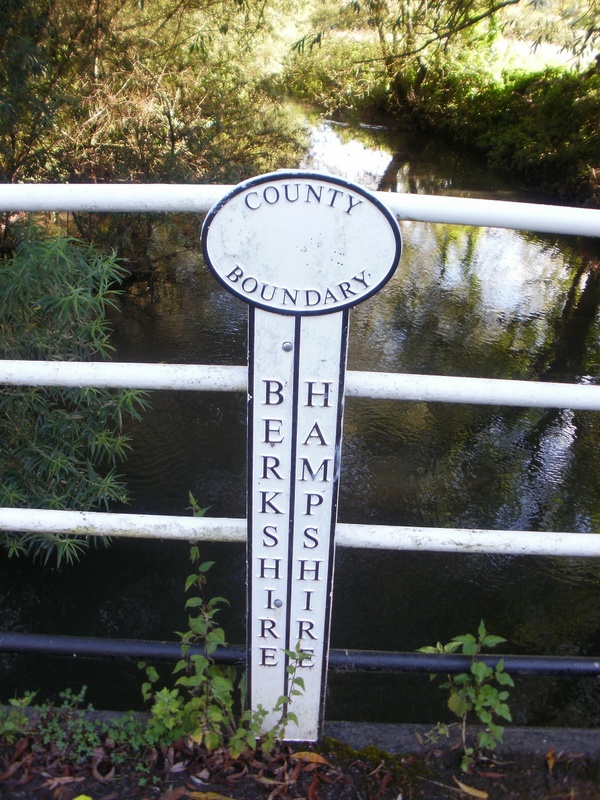 Indeed this closeness of the county boundary was celebrated by our first cache of the day called County (Re) Boundary. 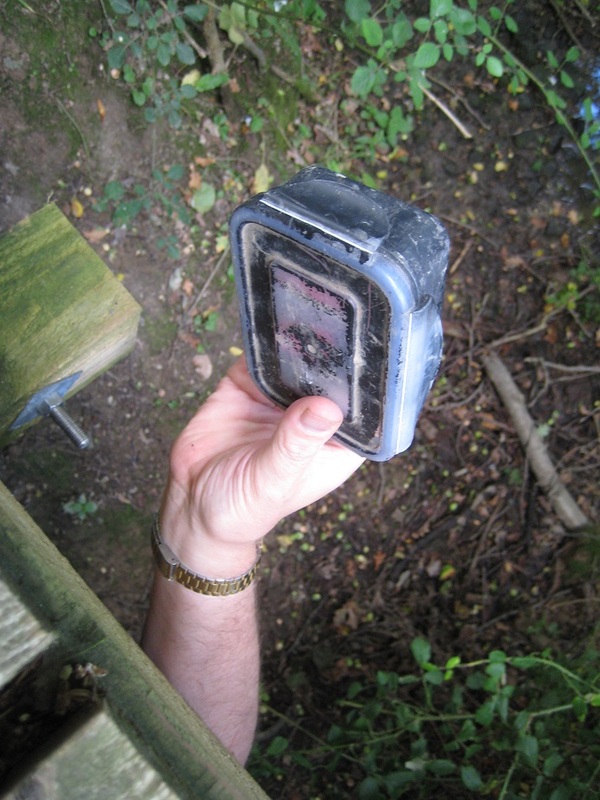 This cache was a replacement for a previous one, and we suspect hidden in the same place. In a tree bole, 6 feet above a muddy bank. 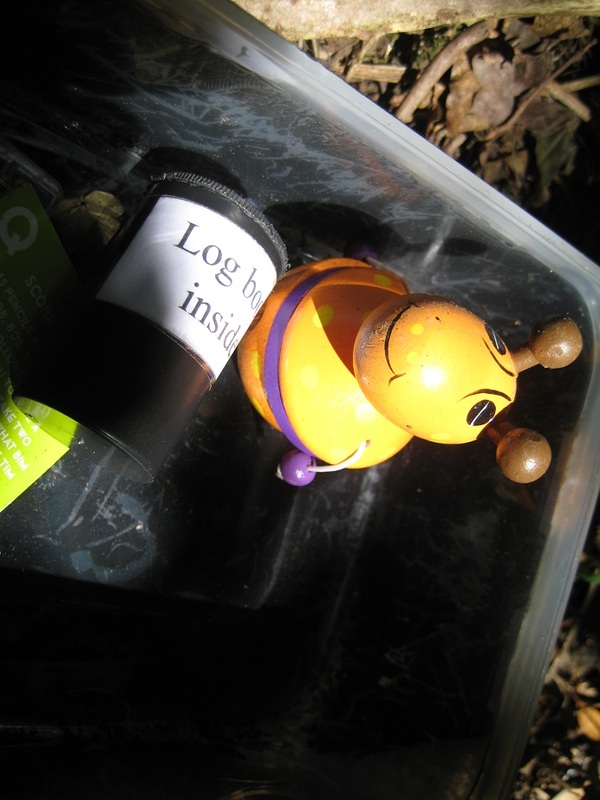 Mr Hg137 scrambled up, located the cache and passed it down for Mrs Hg137 to sign the log and retrieve 2 trackables : Monkey Magic and a World Geocoin. What a good start to the day! 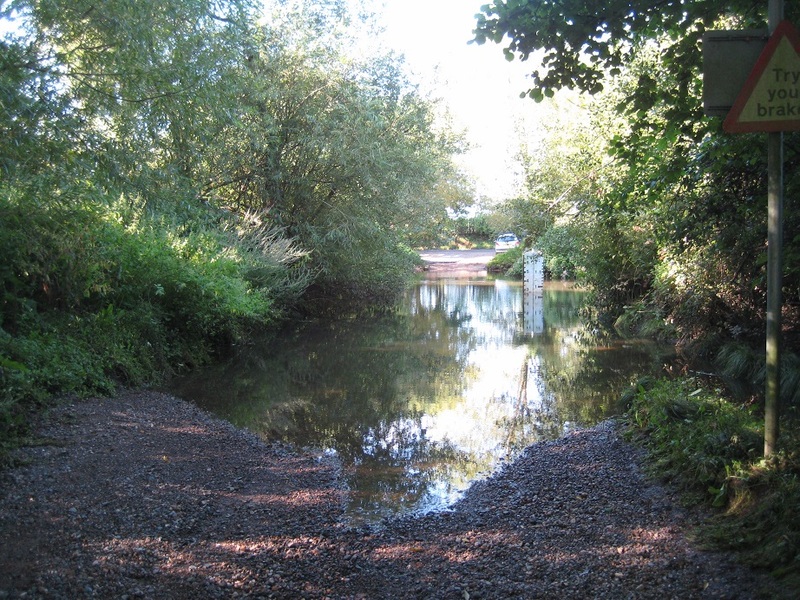 We then started on the Farley Forage route, crossing the River Blackwater not by the ford but via a small concrete bridge and arriving very quickly at Farley Forage #1. 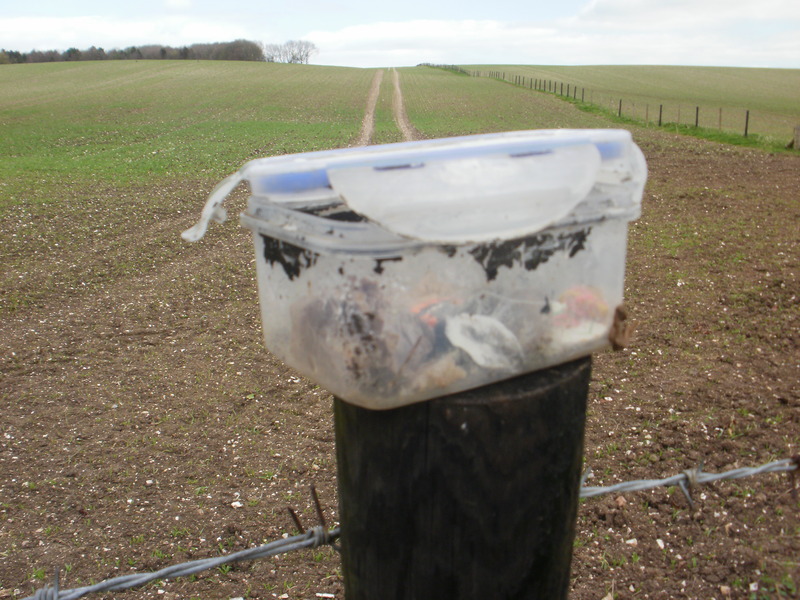 We had read that the previous finder had reported the cache container was broken so we had taken along a film canister to provide a further layer of protection. It wasn’t needed as the cache owner had been out and fixed the cache before 9 o’clock! 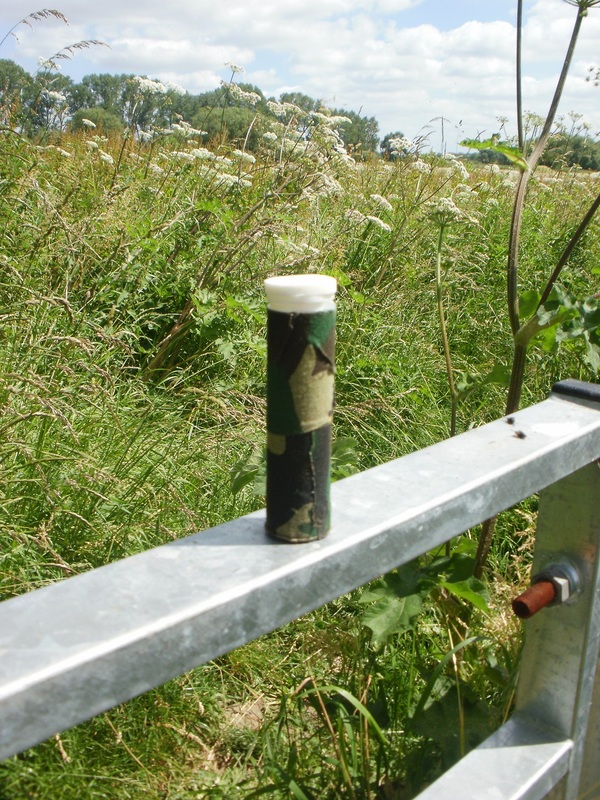 The cache owner, Twinkandco, places small caches, generally nano sized, sometimes a film container, but nearly always connected to a piece of rural camouflage. 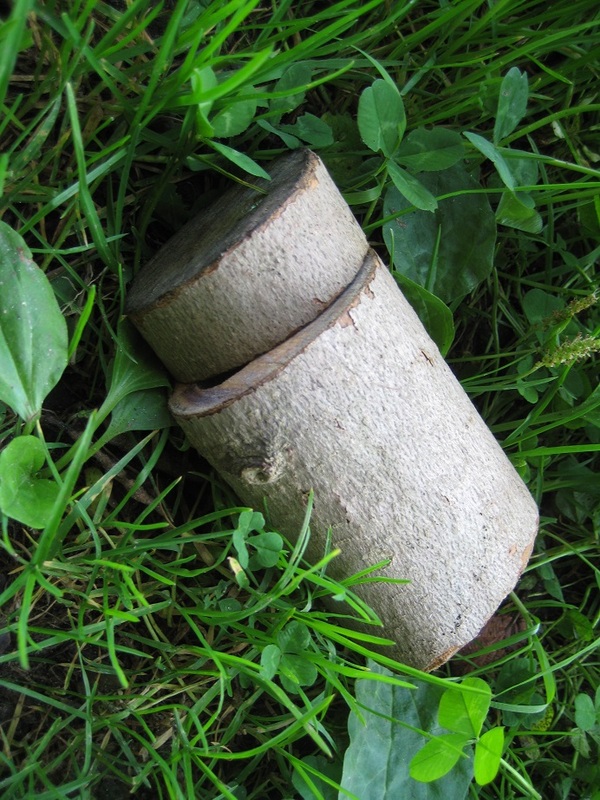 Sometimes the container is inside some bark, or a log, sometimes with a ‘tail’ inside a tube.. but always great fun! 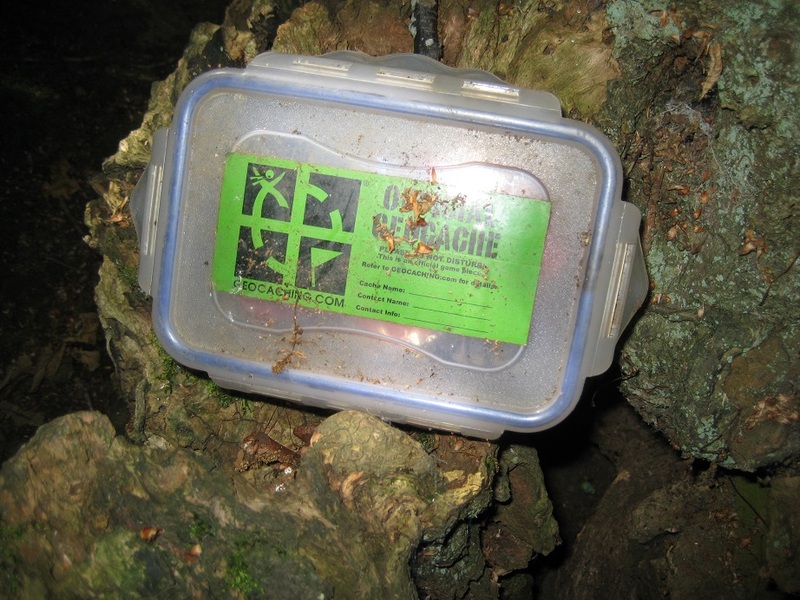 All of the caches are easy (ish) to find, but sometimes a bit of bank scrambling is needed for retrieval. 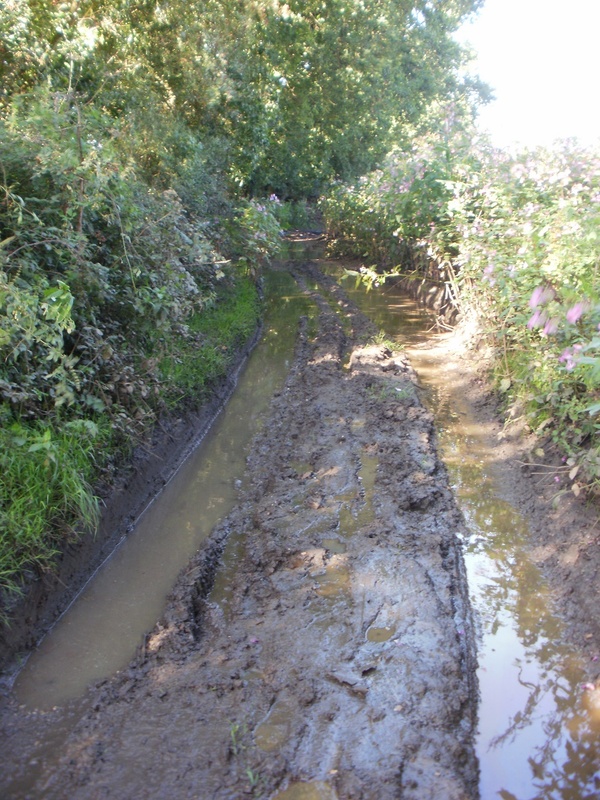 This series had been advertised as ” … very wet and boggy in places after rainy weather and WELLYS ARE HIGHLY RECOMMENDED“. We had worn walking boots, and we were grateful we had, as shortly after cache 4 came the mud. Two hundred yards of it. The path was one giant mudslide. We picked our way between the soft, squelchy mud, the really slippery mud and the much-easier-to-walk-on shaly mud. In fact while we were traversing the mud we almost forget to see how close the next cache was, and nearly walked by it. The Farley Forage series consisted of 16 caches and we had two others to find on our 4 mile walk. 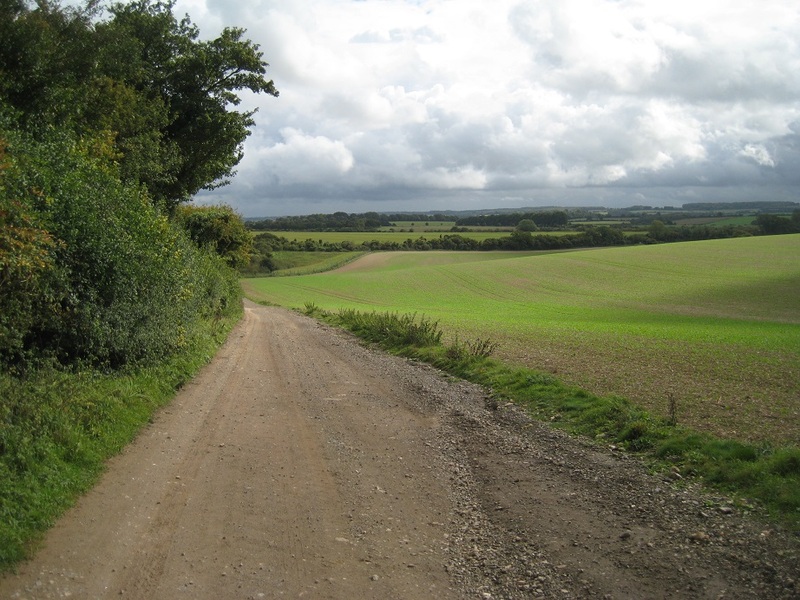 The County (Re) Boundary was one, and we were soon at the other, Sandpit Lane. 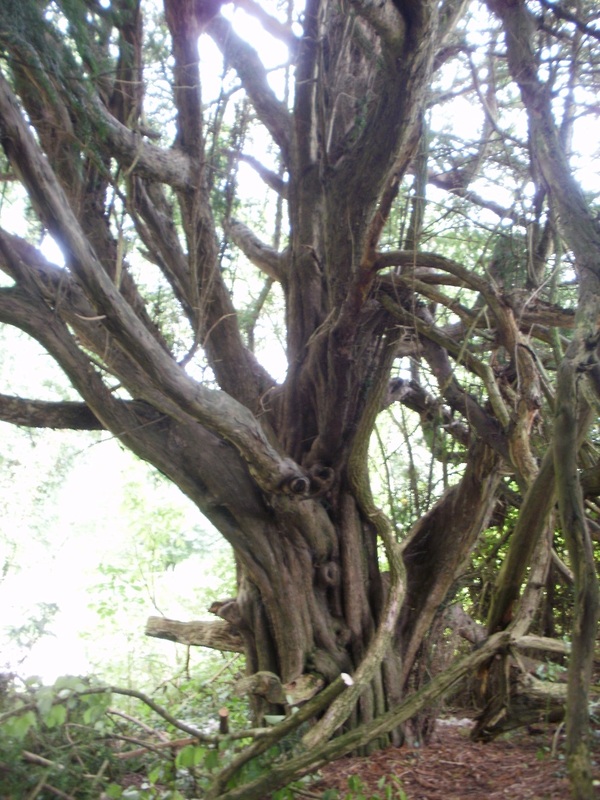 We had several host trees to search here, and it was only after a few minutes that we managed to find the cache. The Farley Forage series contained one multi, and due to some over-zealous navigation on Mr Hg137’s part we approached the first part from the wrong direction thus meaning we had to retrace our steps for the final find. We had walked uphill, away from the river and the paths were much, much drier. We had rounded a blind corner on the footpath, and discovered the cache was hidden behind a tree the other side of a large stretch of mud. (We knew the cache was there, as a plethora of muddy bootprints pointed towards the tree!). 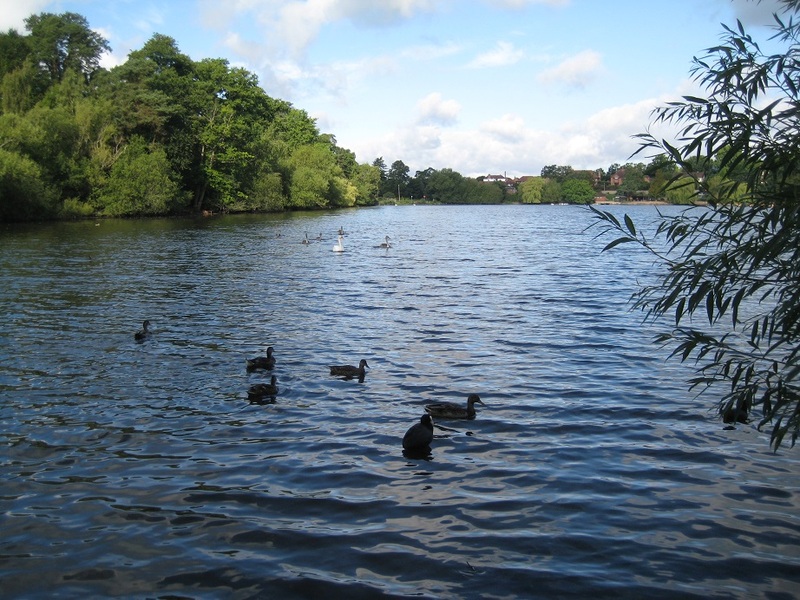 Mrs Hg137 ventured across, and retrieved the cache at the second attempt. It was just as the log was being signed when 2 people came round the blind corner. But no! They were cachers too. 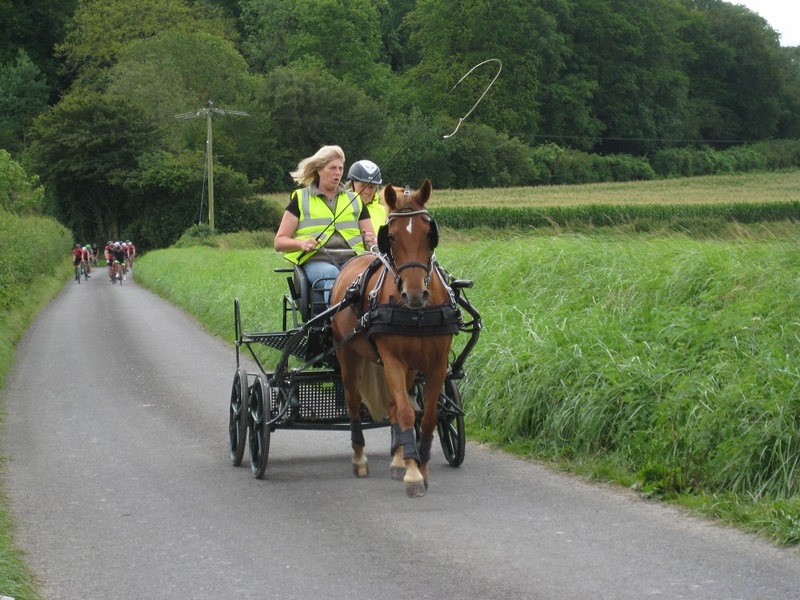 Penwood Plodders – another husband and wife team. We made sure they endured the mud by asking them to replace the cache! 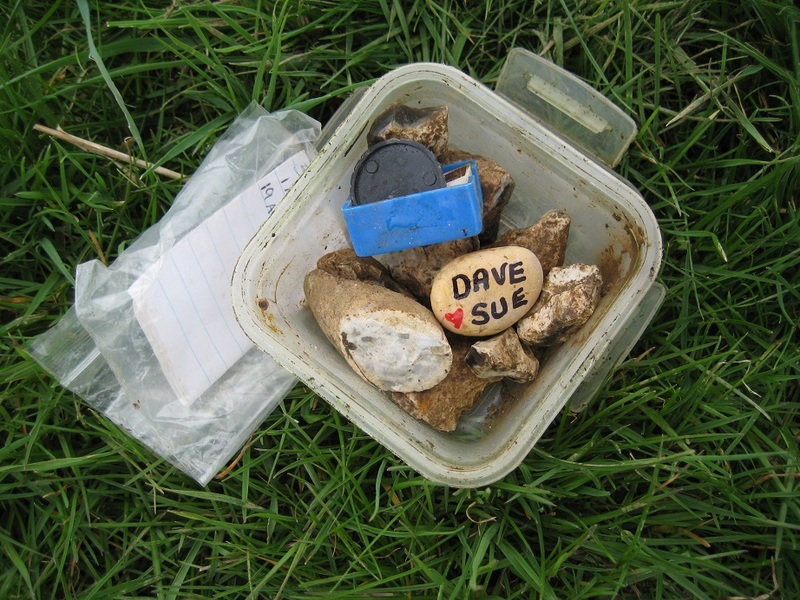 We walked on with them for a cache or two, chatting about the Devon Mega, the mud and caching in general. It became apparent that their walking pace, and cache administration, was quicker then us, so we allowed them to speed ahead. Nice meeting you! 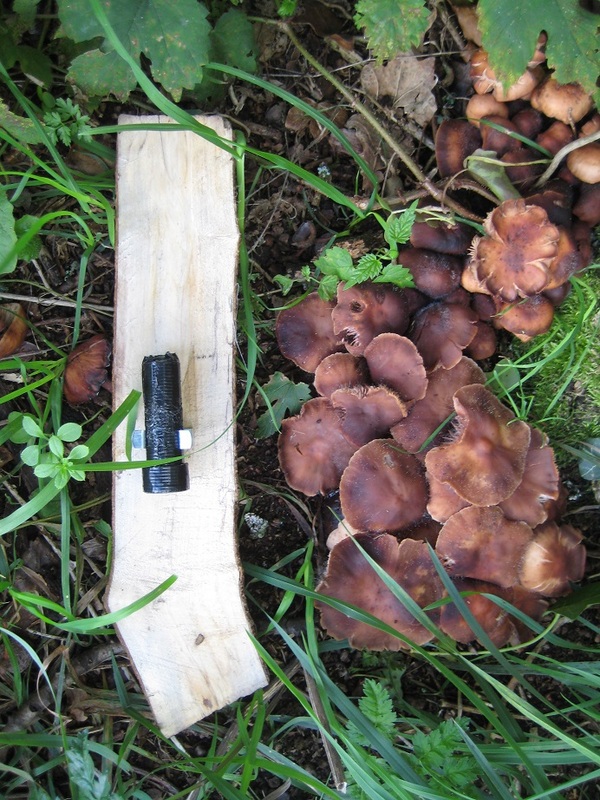 (Ed: in case you are wondering why it takes longer to write ‘hg137’ on a log rather than ‘Penwood Plodders’, its because we scribble down a brief note about each cache, our experience at it, as well as taking a photo for this blog). That’s better… a bit drier here ! The next section of the route was relatively uneventful, the cache containers maintained their uniqueness. 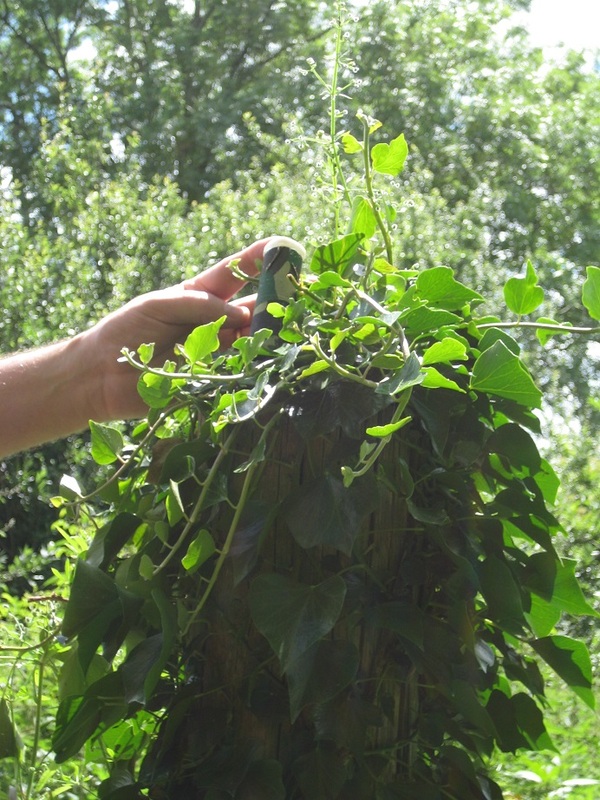 As we re-approached the River Blackwater we crossed a few stiles (always good hiding places) and well as a cache hidden deep in a nettle bush. 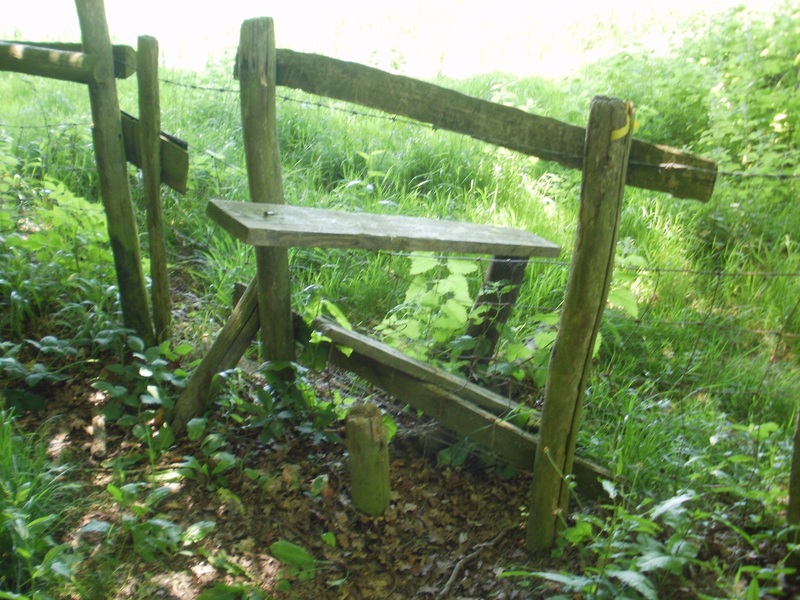 Somewhere.. near to this stile’s signage .. may be a cache! Several times we thought we were catching up with Penwood Plodders, but every time they were returning to the footpath having left it to find a cache. 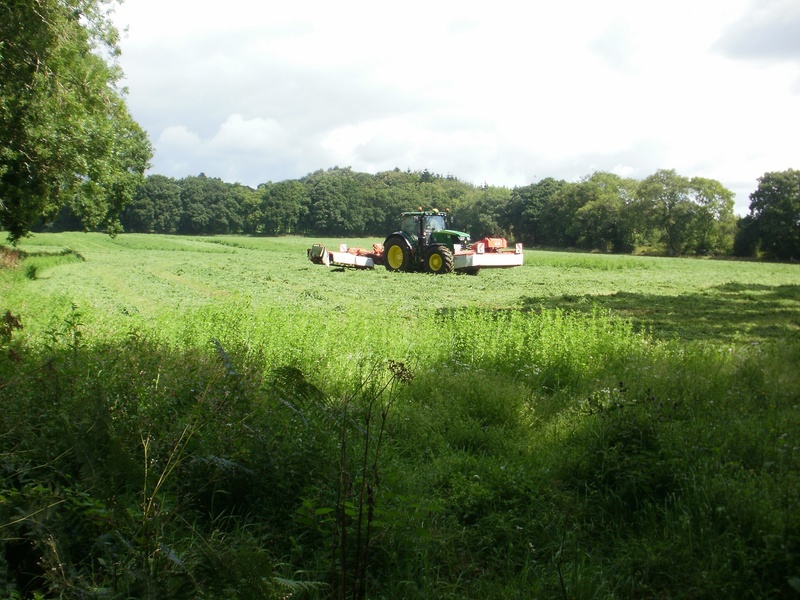 For much of the day we could hear the sound of farm machinery, and as discovered caches 12-14 we were walking alongside the farmer’s field. What he thought of two pairs of ‘ramblers’ walking along the footpath and both pairs stopping mid-field, in the same spot, we shall never know. We were expecting more mud on this section as the river was only feet away, but the paths were dry and meant the mud layer on our boots was quickly being walked off. 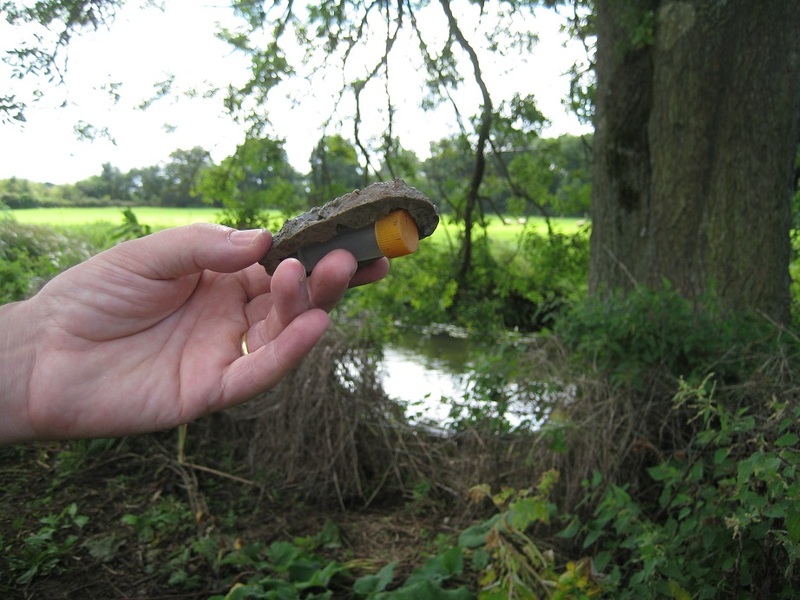 We found all the caches on route – a very enjoyable 4 mile walk – full of interesting finds and varied countryside. If you are in the areas of Farley Hill.. we recommend the series to you! Our last caching trip on our Sandhurst (Berks) to Sandhurst (Kent) finished yards from the Kent border, and when we drove away we had thoughts of striding purposefully into Kent and onto Sandhurst… however since our last visit we were asked to undertake a small diversion while still in Sussex. Kent is ahead of us..but we’re not going there, yet! 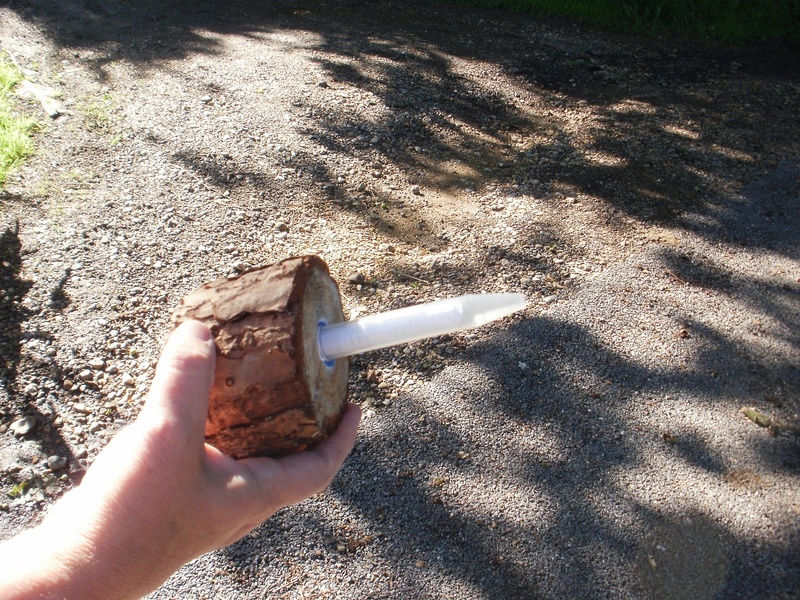 The last cache we found on our previous trip contained a sheet of paper with the ‘Northings’ for the Great Wigsell Multi. 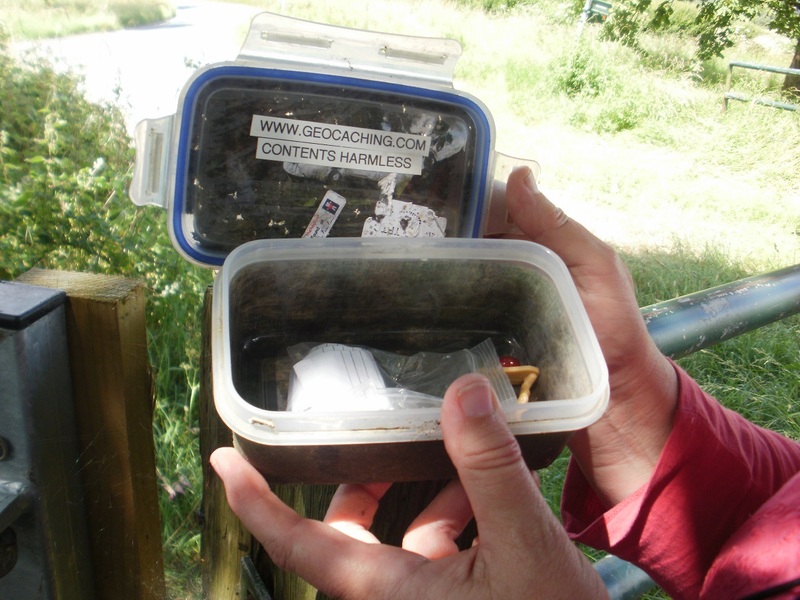 Another cache, unfortunately now archived, contained the ‘Eastings’. This meant the Great Wigsell Multi was unreachable. 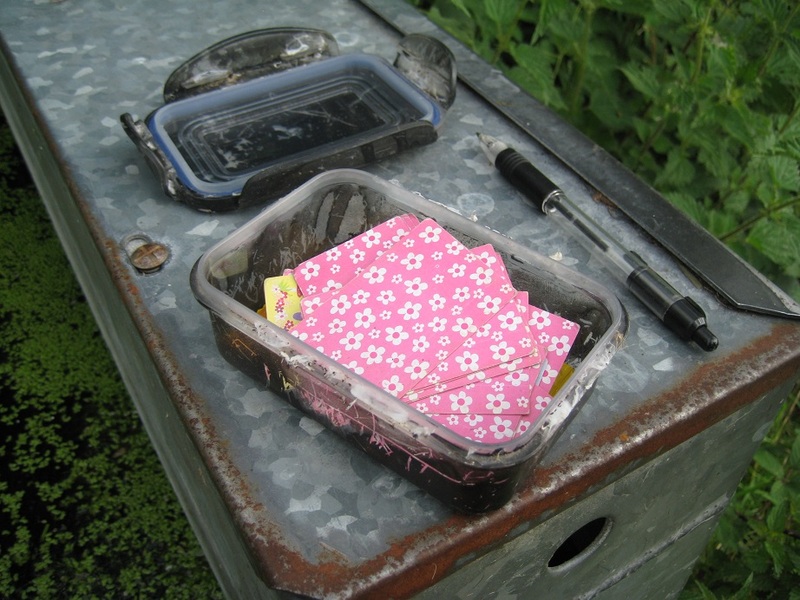 The cache owner of these three caches contacted us with the missing information and asked, if we had time, to visit the Multi as it contained a trackable which needed to be moved on. And so instead of heading East into Kent, we headed further South through light woodland for a 1/3 of a mile. We were pleasantly surprised on our arrival. 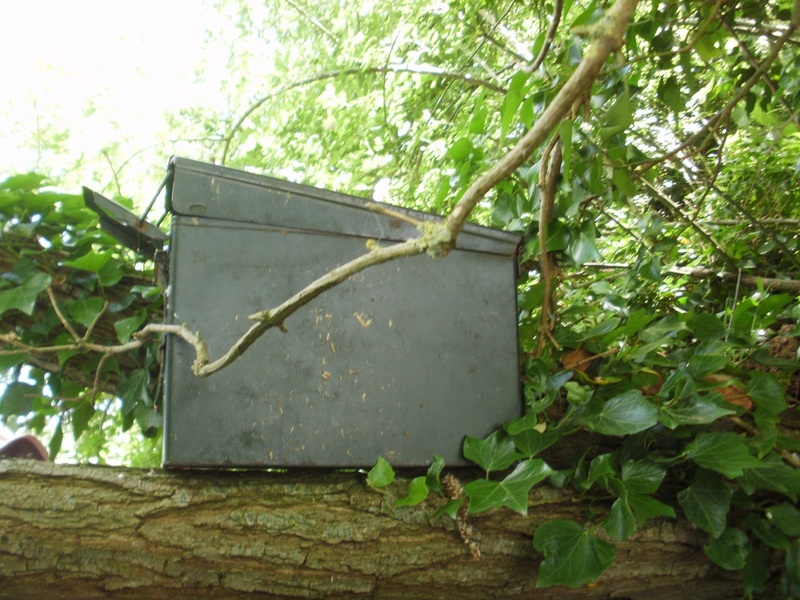 Not only was the cache there after an eight month gap…but it was an ammo can! 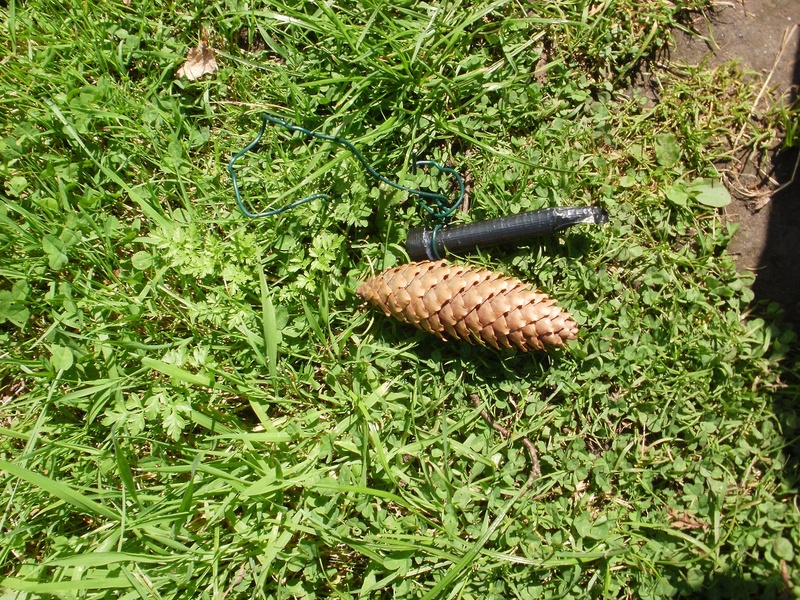 We released the trackable and headed back to our car, wondering how many other cache owners we would be helping on the this holiday (see previous blog for more details). Before finding the Great Wigsell Multi our day had not begun well. There had been a major accident and our route to the Kent border had been blocked. 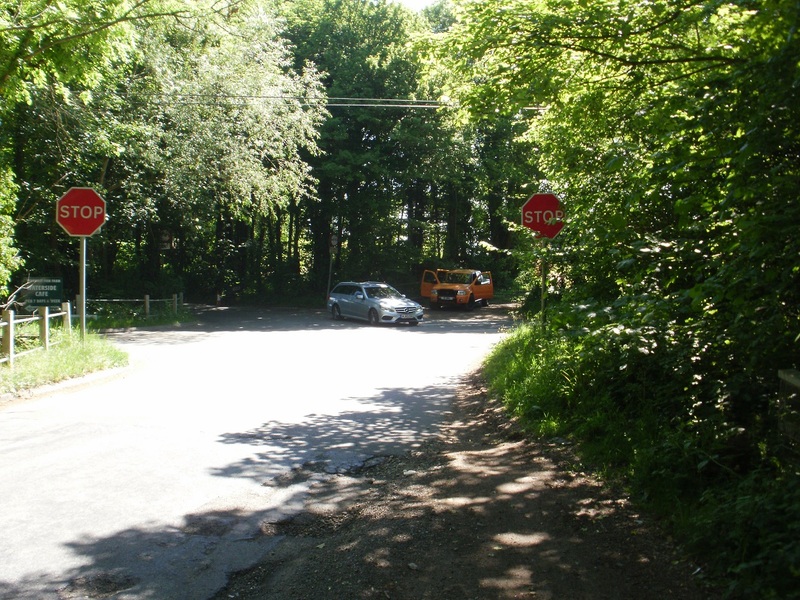 A plethora of side roads were also blocked with roadworks so we had had an interesting drive to our start point. 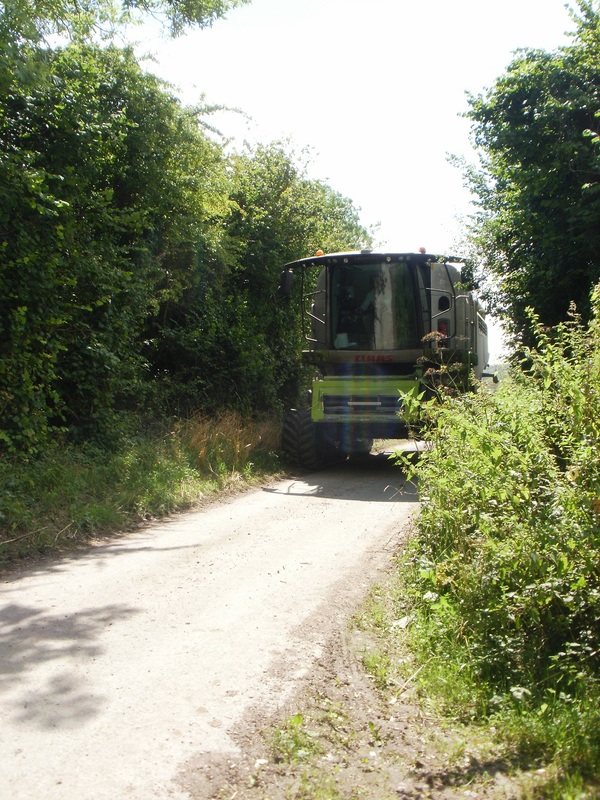 Our route was to take us 2/3 mile along a narrow country lane, unfortunately this was being used as one of the few roads open. We edged our way along, taking care watching out for traffic. Or at least that was the agreed plan. 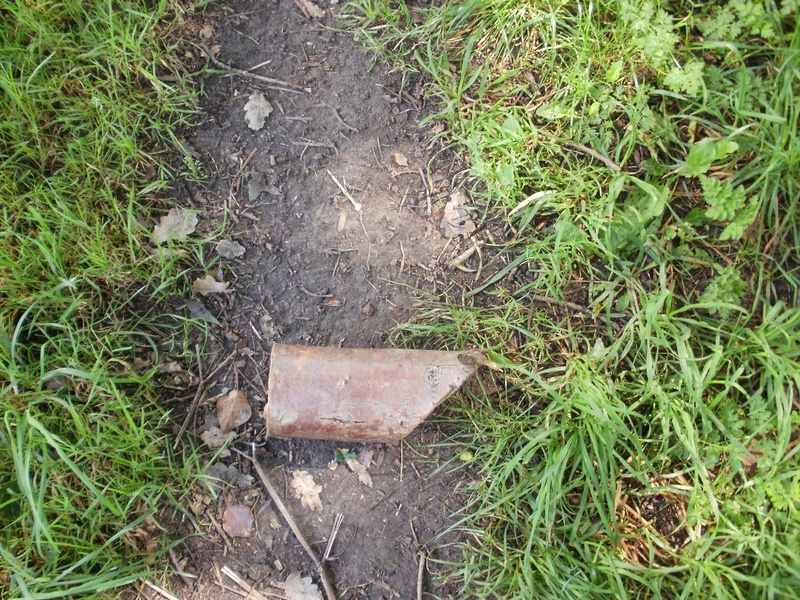 Sadly Mr Hg137 decided to check maps/GPS whilst walking up the pavement-less road and failed to spot a large pot-hole. He landed considerably worse for wear, face down, lying on the tarmac. Grazed wrists, ripped trousers, and several layers of skin removed from a lower leg. Ouch! He limped to a gap in the roadside, where a passing motorist provided us with a few tissues which staunched the wounded leg. 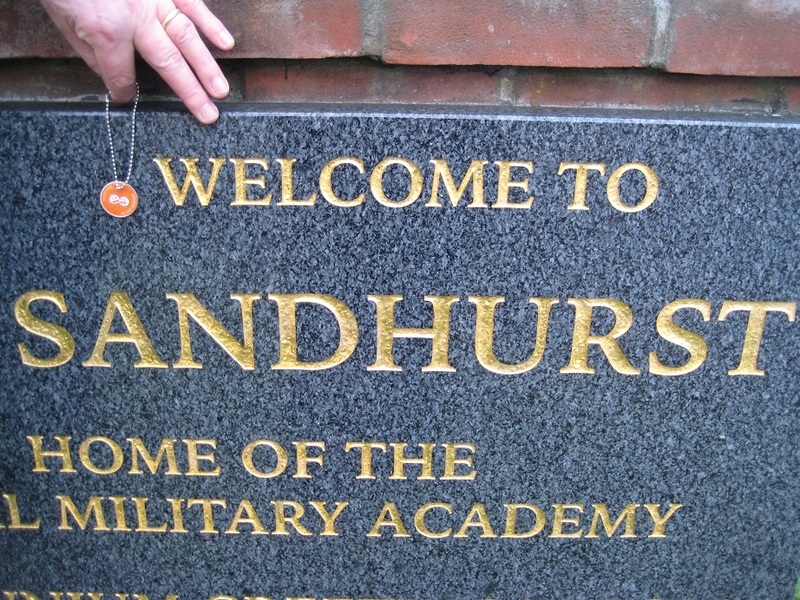 We both thought that having walked so far on our Sandhurst route, we would fail with just 2.5 miles to walk! 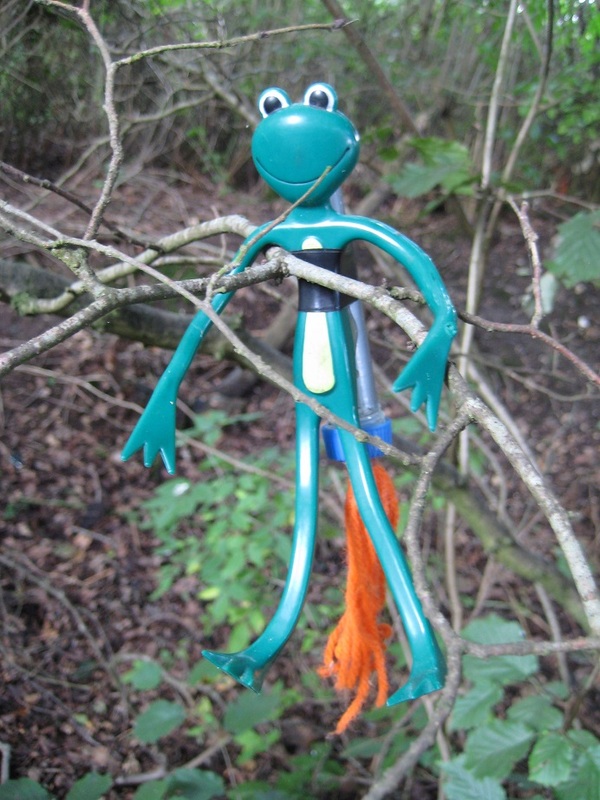 Eventually Mr Hg137 stood up. The bleeding had ceased, and he could put weight on the injured leg (hidden behind the ripped trousers). We were following, for the last time, the Sussex Border Path, which up to that point had been brilliantly signposted. Sadly when we needed a post to show us the way to a cache 300 feet away, it was missing. No obvious track through farmland, and with some way still to go, we abandoned our search before it really got going. We knew we were getting close to our destination though as the cache belonged to a series entitled “Sandhurst Cross Circular Walk”. The route took us through a farm. Clearly the farmer had had trouble with hikers, as there were a plethora of “Keep to the Path”, “Close the Gate” type signs. 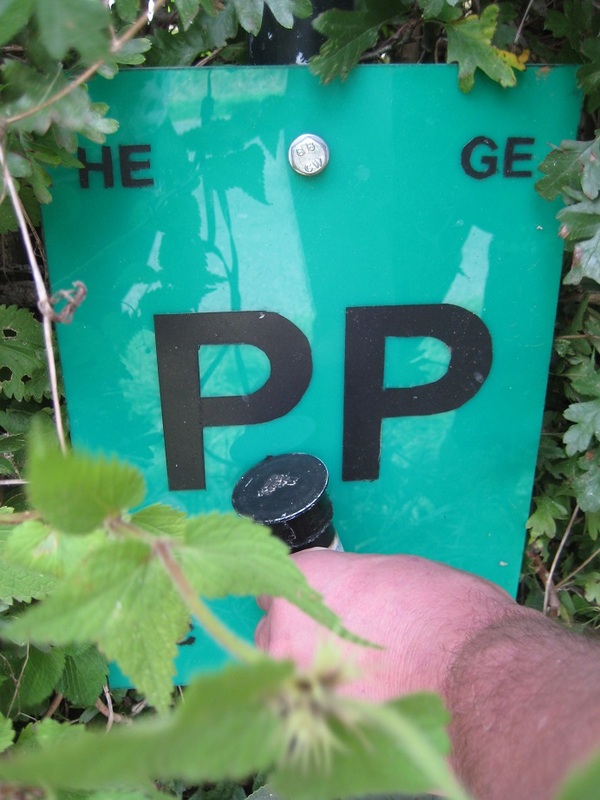 However the farmer had failed to mark the signpost clearly as we approached his back garden, and the fingerpost was angled for us to walk straight through his garden rather than a tiny path just by the fence line. 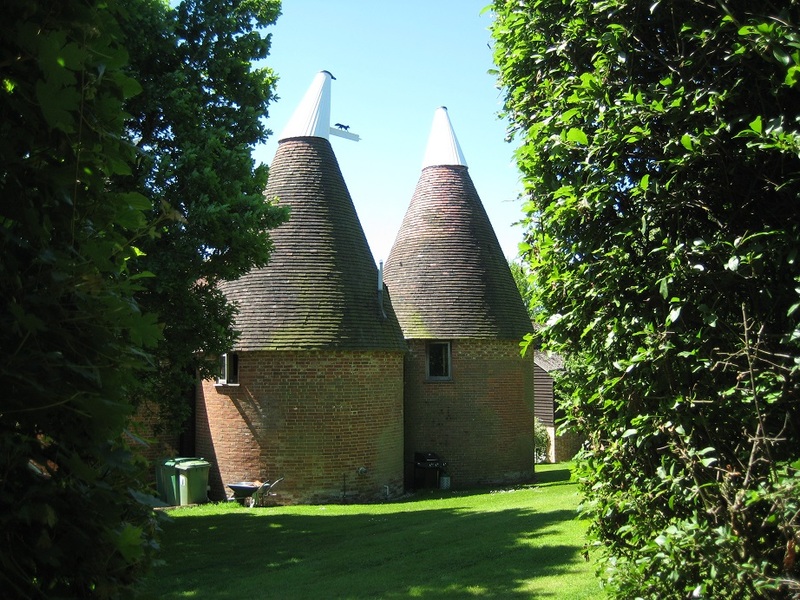 You can’t walk through Kent without seeing some of these! It was shortly after this we found our first Kent cache on the walk. Hidden in tree roots. It had been well over an hour since our finding of the Sussex Multi so were grateful for an easy find. Our route took us through woodland, and around farm fields. 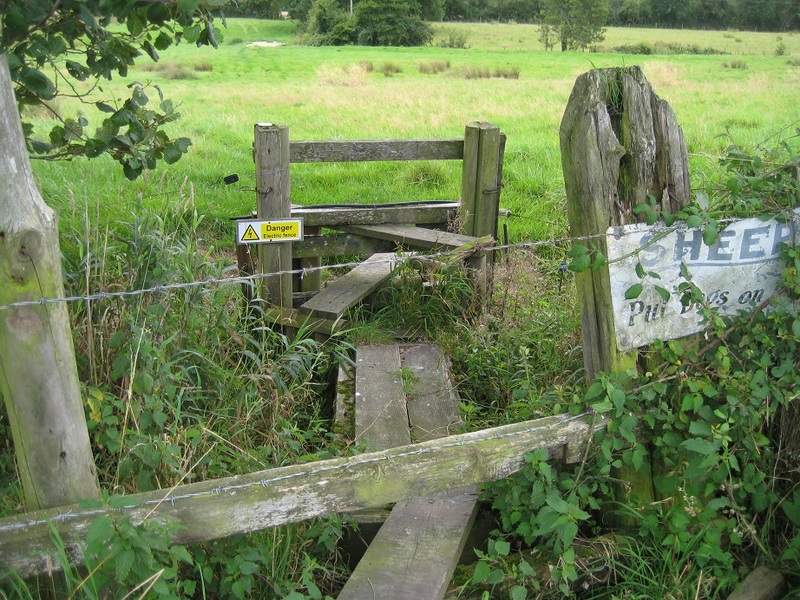 We crossed far too many stiles for our liking (too tall for Mrs Hg137, too wobbly for Mr Hg137’s now-healing leg). 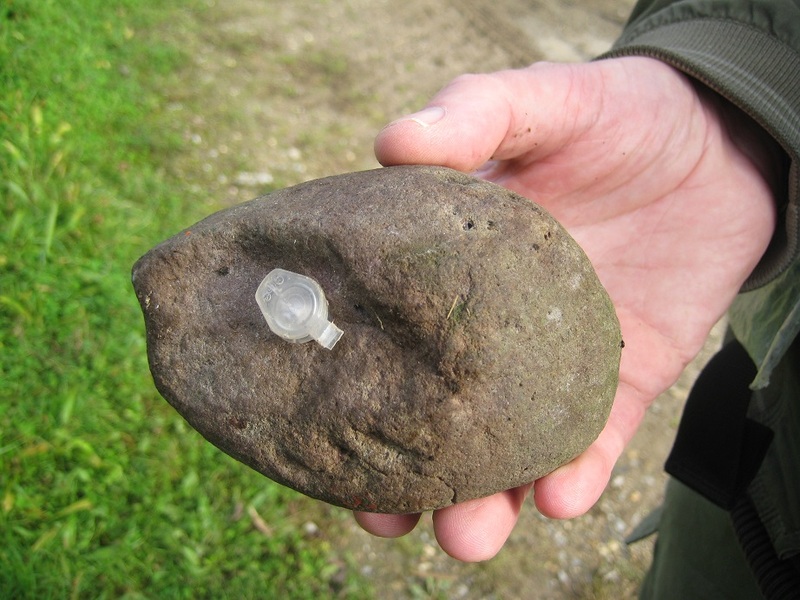 And then we arrived at a Roman Road – and another cache. Again hidden in tree roots. Here though we had a long search. Lots of trees, and lots of roots. 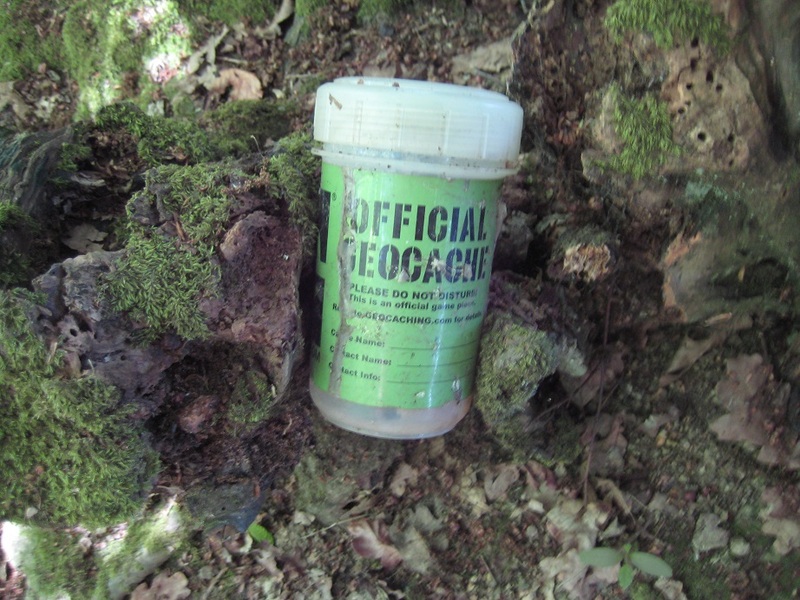 Did the Romans leave this geocache for us to find ? We were eventually successful and strode/limped purposefully the 1/4 mile into the village of Sandhurst. 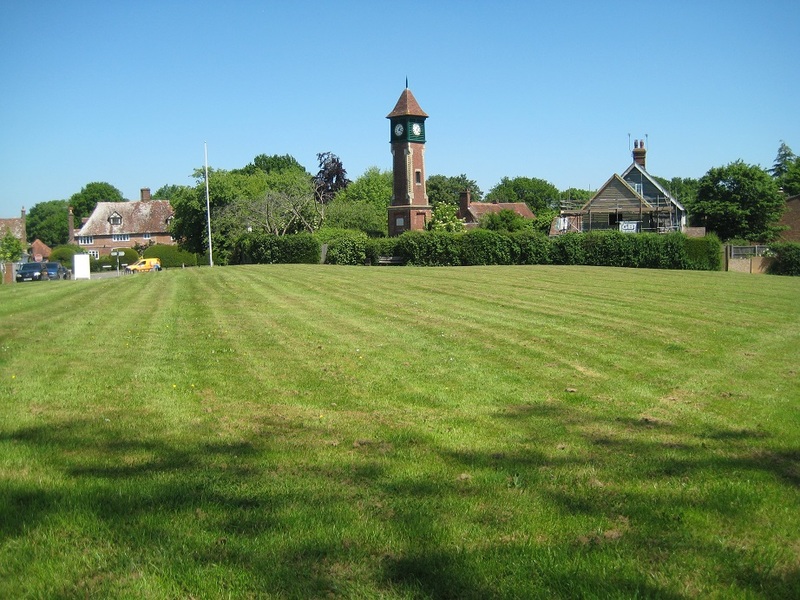 A beautiful village green and fabulous clock tower. Our journey was complete. Our final cache was under the clock tower, and we waited ages, for a bus driver to vacate the seat on which the cache had been placed. Our final cache on this walk! A fabulous setting for the end of our walk! And so our walk was at an end. We finished in high Summer on a boiling hot day. We had started in the height of Winter, with ice on the ground. We had caught trains and buses. 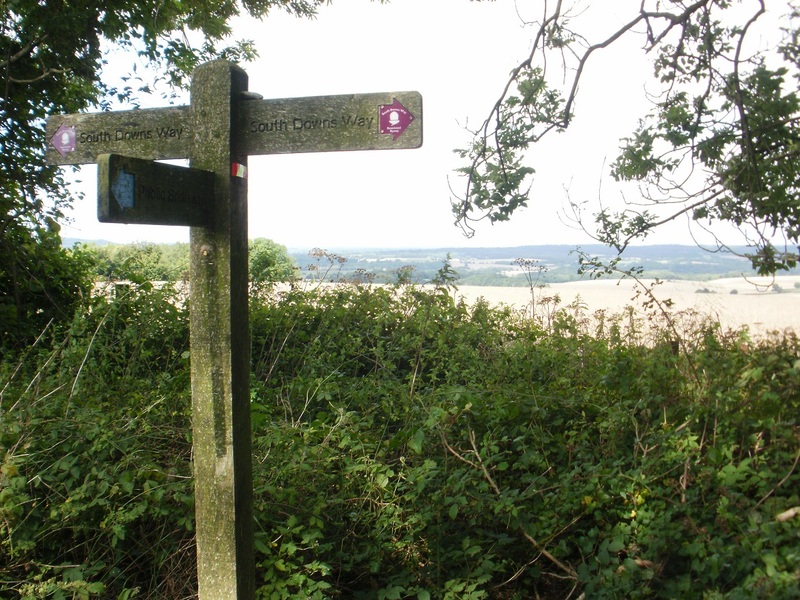 We had used many a long distance path including the Blackwater Path, The North Downs Way and the Sussex Border Path. We had walked beside canals, rivers and underneath a major flight path. 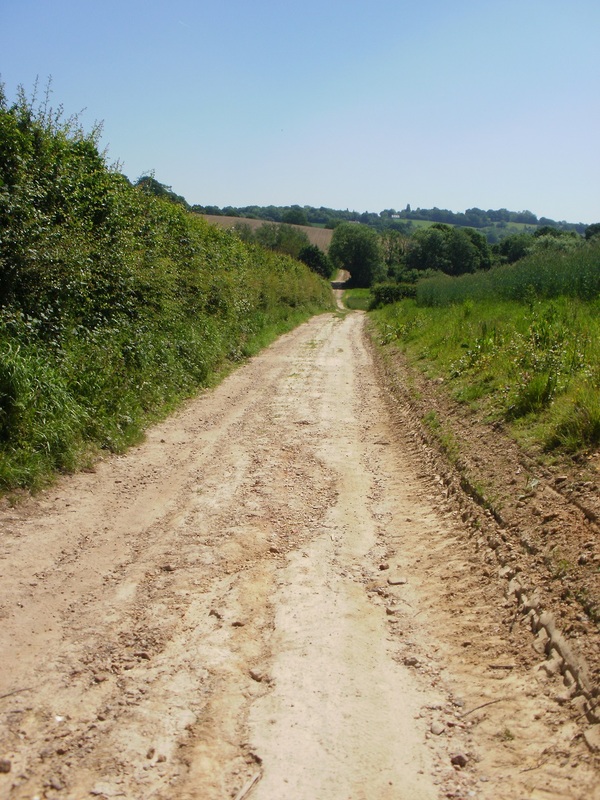 We’d walked over Surrey’s highest hill, and walked through the claggy clay of the Weald. We’d undertaken quite a few Church Micros and learned about such diverse people as an Astronomer Royal and the founder of Ottawa. 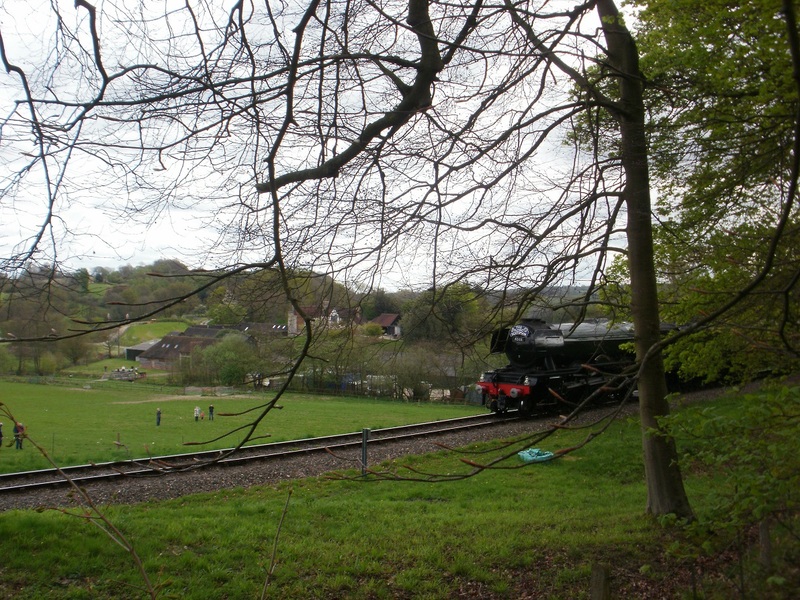 We even saw the Flying Scotsman! We’d heard lots of birdsong and been lucky enough to see deer, a heron, an adder and a kingfisher. An excellent adventure which we thoroughly enjoyed. As we noted on January 1, there is another Sandhurst, near Gloucester, a journey which we will undertake probably next year. Do look out for that! 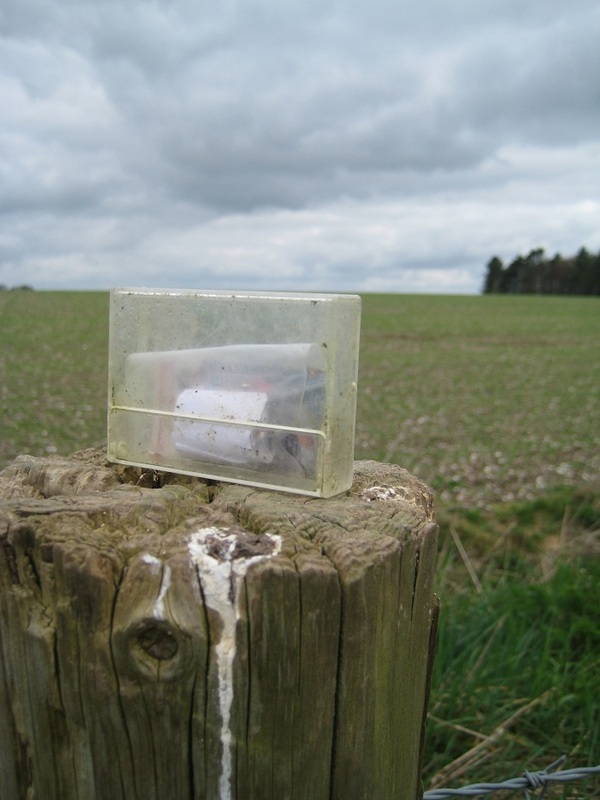 Spring and sunshine were definitely in the air and we decided to go further afield for our next caching adventure. 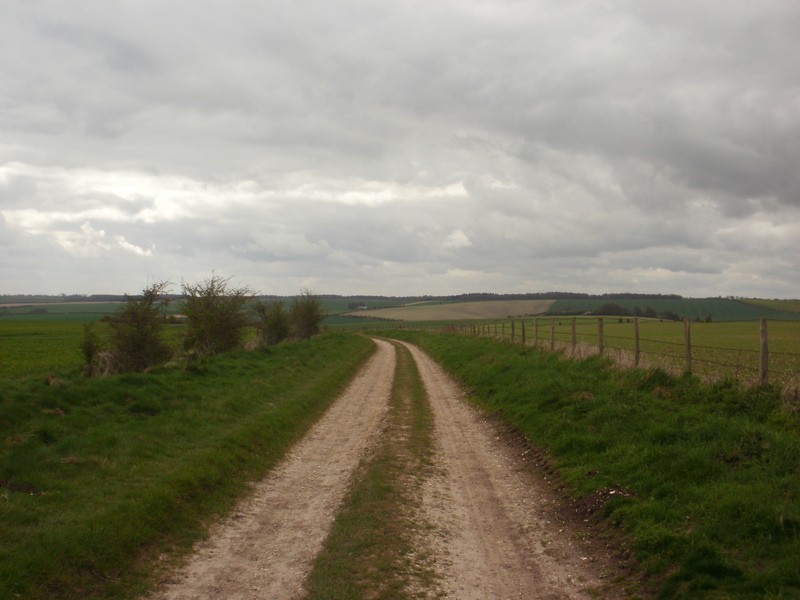 The Ridgeway on the Oxfordshire/Berkshire border. This was an area we had a fair knowledge of, as we had walked there before (we walked the whole 80+ miles of the Ridgeway in 2012), but had never cached on this section of the Ridgeway. 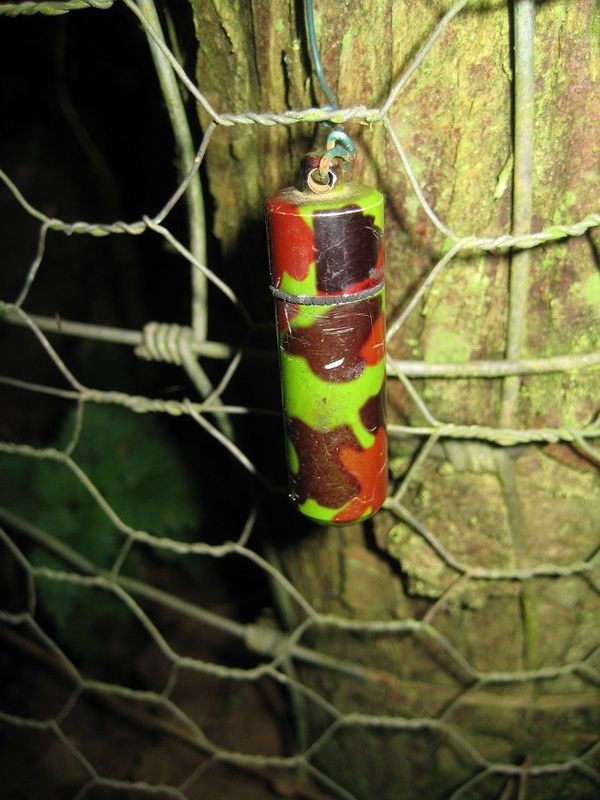 There was a great circuit of 23 caches and another on its route. We then discovered if we made a diversion or two we could attempt 9 other caches including two mini series of 6 and 2 caches and an easily solved puzzle cache. 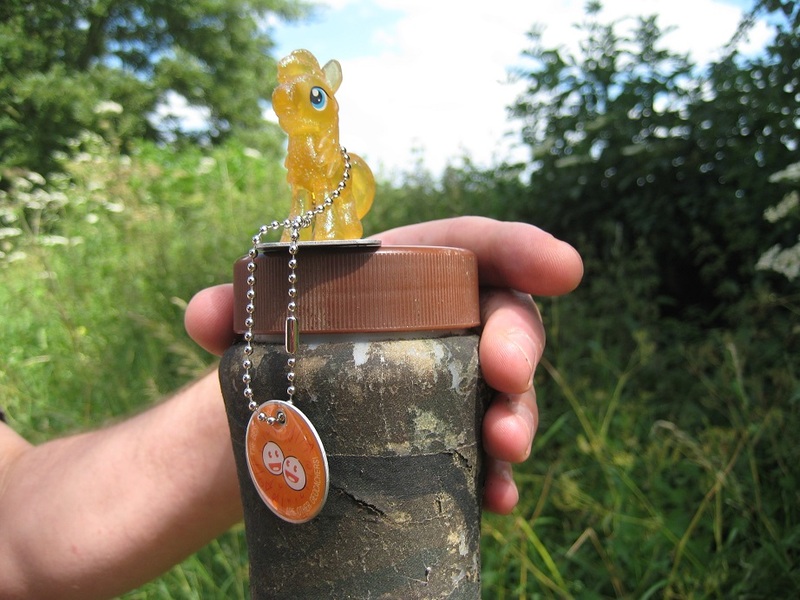 This would give us a total of 33 caches, which if we found them all, would break our best daily cache haul of 28 (set in August 2013). After an hour’s drive we arrived at a car park on the Ridgeway itself. 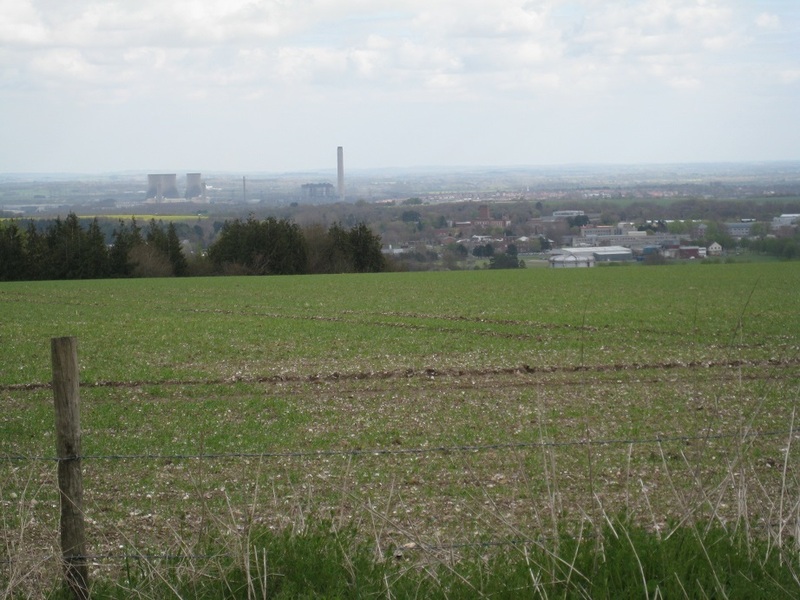 Without even leaving the car there were great views of farmland to the South, and to the North, the three remaining towers of Didcot Power Station. As an aside, many people view such buildings as a blot on the landscape, which to an extent is true. But as a landmark, they do give aid in evaluating distance. When we walked the Ridgeway in 2012, the (then 6) towers were visible for at least half the Ridgeway’s length, which definitely gave a “Wow we’ve walked all that way” feeling! Anyway the remaining 3 towers are due for demolition later this year, so we said “good-bye” to our walking companion of 4 years ago. 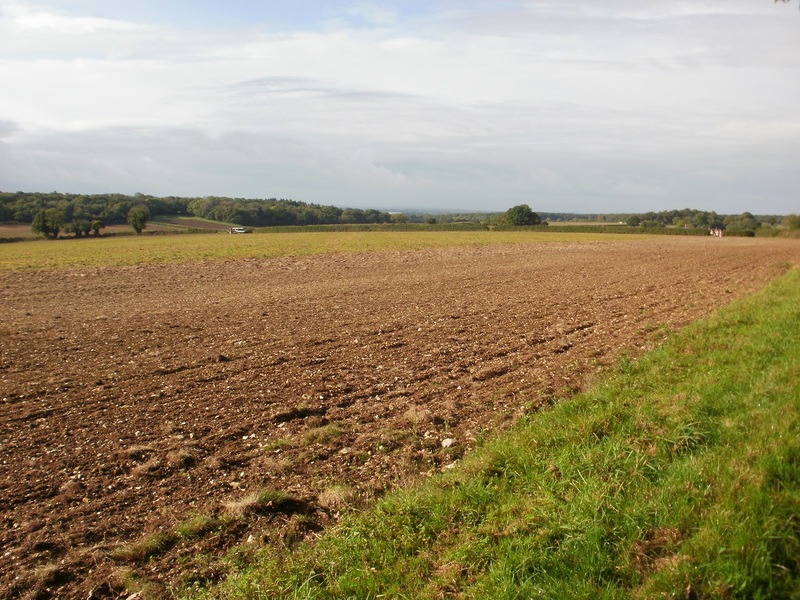 The Ridgeway is quite an open landscape as the chalk soil does not lend itself to large wooded areas. There are some trees, but these are in tiny pockets. 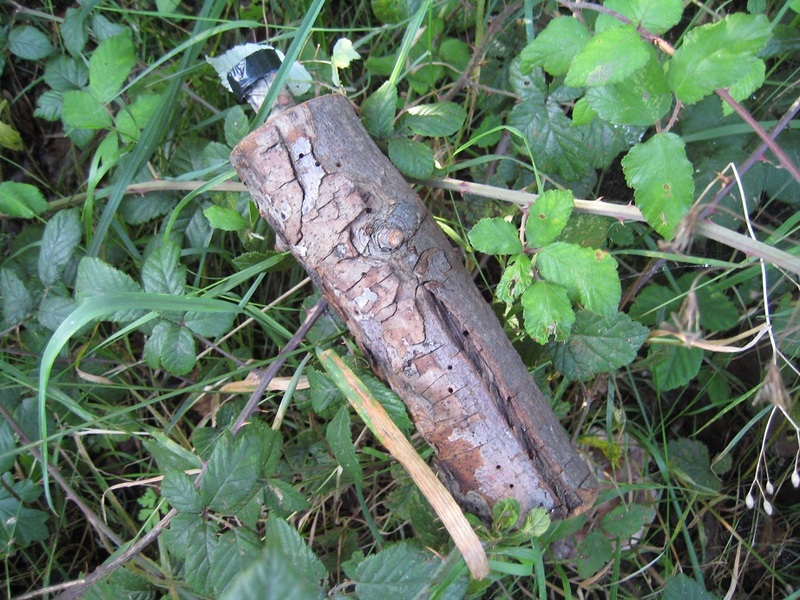 Most of the caches were found were next to field posts, frequently well hidden in grass, and quite often under burgeoning stinging nettles. (The geo-pole was absolutely essential for these). The series was entitled a Chocolate Series, though many of the cache names were not obviously chocolate – for example Lemon Mousse, Nougat, and Turkish Delight. We found the first three caches very easily and thought (mistakenly!) we were in for a very easy day. Never, never, never think that when put caching! We failed to find number 4 (Coffee Cream). 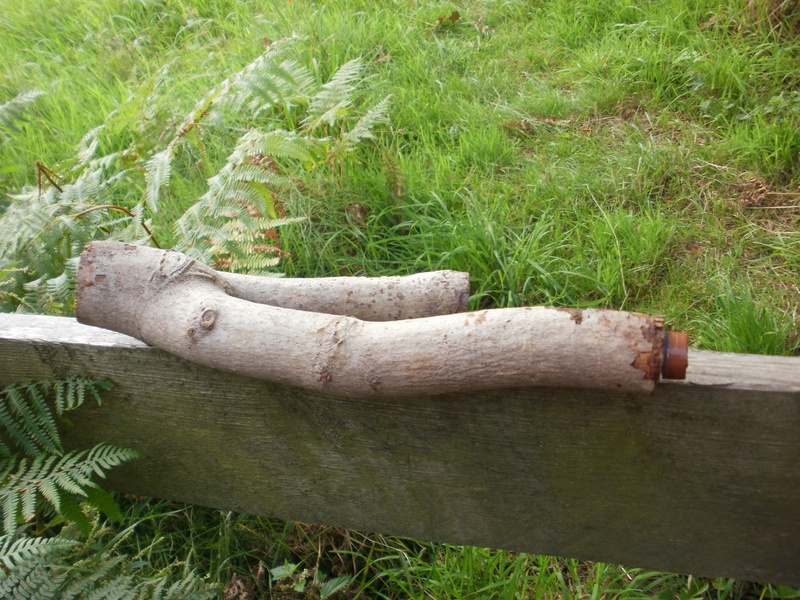 Every fence post near GZ had been well cleared of vegetation and there was no cache to find. Looking at the cache logs it has not been consistently found since mid-February. An occasional cacher has logged a “Found It” visit, but then written in the log “DNF” ! Standing at GZ does not count ! Logging “Found it” means the cache owner thinks the cache is there and won’t check it! Grr! Lovely pile of stones.. but no cache underneath! We had a similar experience at cache 7. 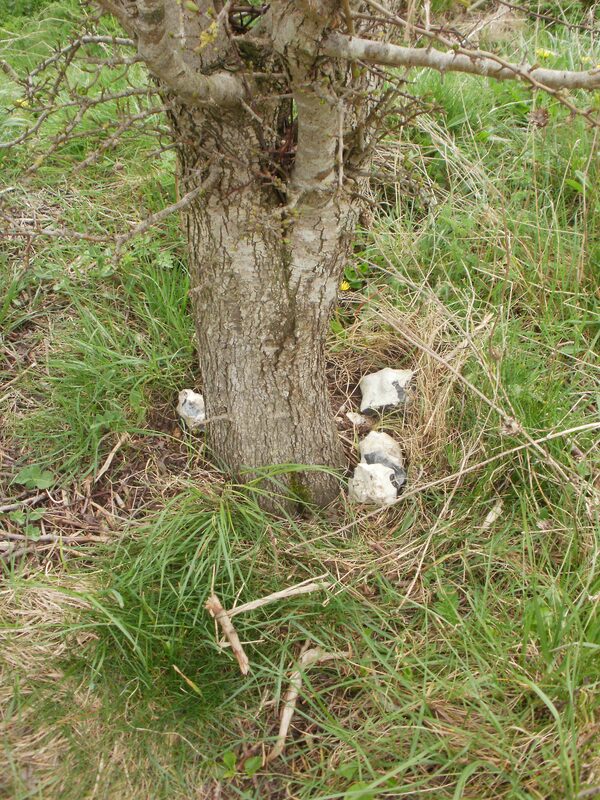 Here though the cache had been found recently, and the GZ was very obvious (a tell-tale pile of cacher’s stones). That’s 2 DNFs out of 7. Suddenly the daily record attempt seems a long way off! Our descent off the Ridgeway was completed at caches 8 and 9 (Orange Cream and Hazelnut Noisette… not making you hungry am I ?). 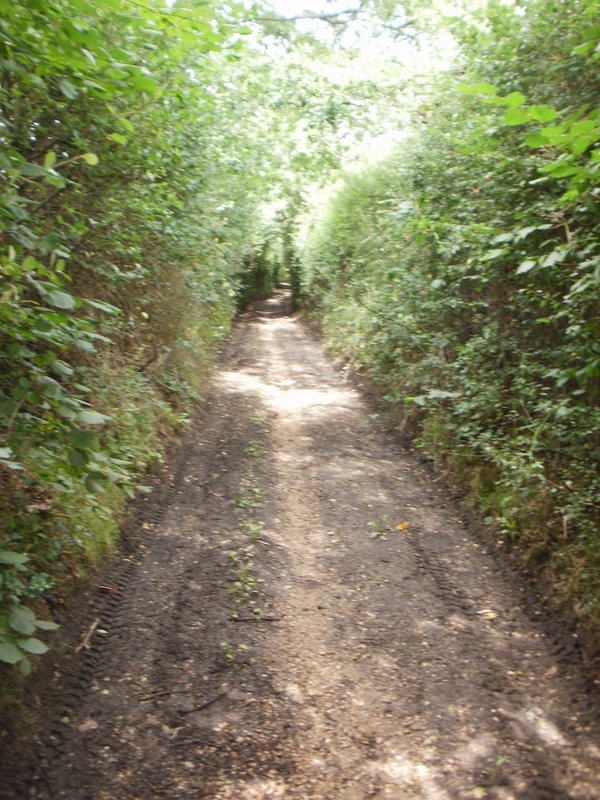 We then a very short walk along what should have been a quiet country lane. In the 1/10th of a mile we walked along the road at least 4 vehicles zoomed passed us – we were grateful for the grass verge. Leaving the road, approaching a farmhouse, we were loudly challenged by the farmer’s dog, shortly pursued by the owner! 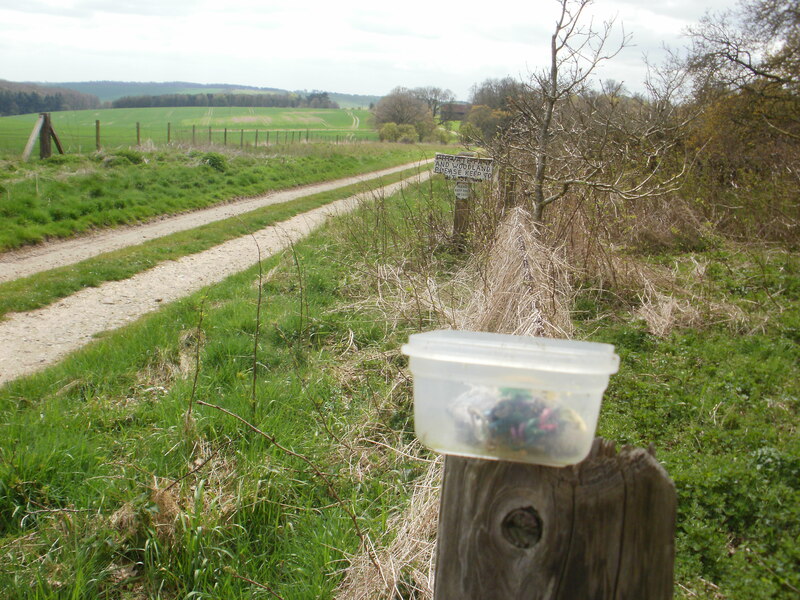 This was at a critical point of the route in terms of path-finding, so as soon as we were out of sight of the farmhouse, we double-checked that we heading towards the next cache, and more importantly back up to the Ridgeway. Many easy finds followed, our only distraction from the route was watching a handful of red kites gracefully gliding in the sky, eying the ground for prey. We tried taking pictures of these beautiful birds, but none of the dozen or so photos we took, did them justice (A black blob on a blue background!). We found every cache on our ascent which left us 8 to find on the Ridge itself. 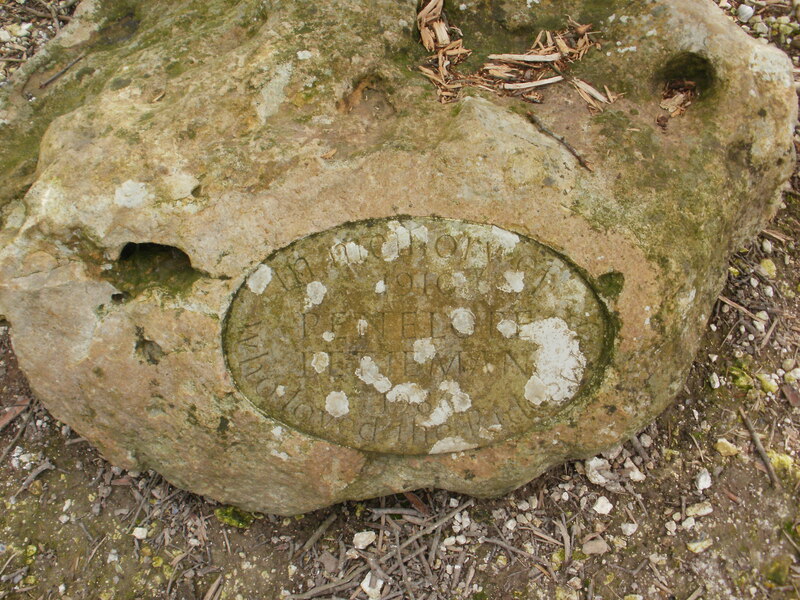 The first was hidden in the back of the memorial stone to the wife of the late John Betjeman. To us it seemed wrong to have a 35mm film canister stuck into a memorial crevice. Admittedly Penelope Betjeman wasn’t famous, but one wouldn’t place a cache in a memorial to say Nelson or Newton so why the wife of a former poet Laureate ? We found the next 4 caches on the Ridge before we descended off the Ridgway (again) to hopefully find enough caches to break our record. So far we’d found 19 from 21 with only 12 more to attempt… things were looking good…will we break our record ? Our last full day on the Isle of Wight and a busy one. 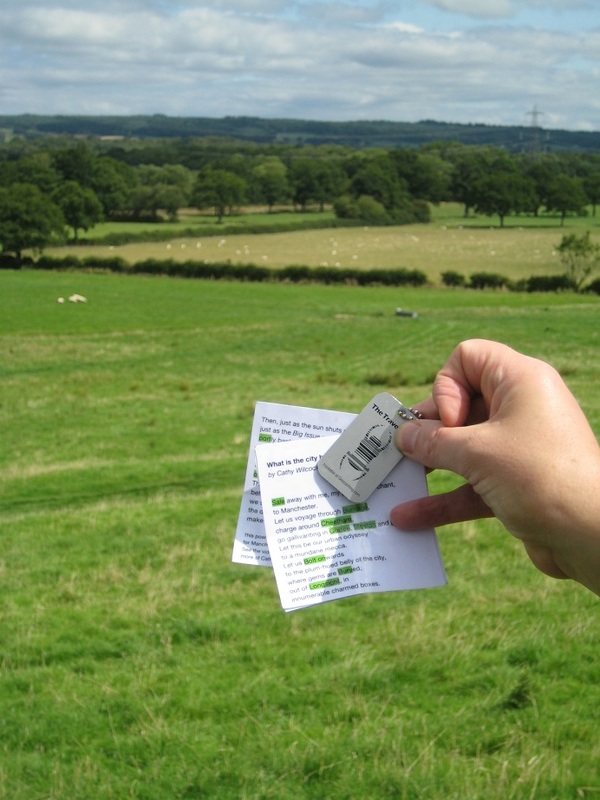 We’d selected 2 Festival walks (one in the morning, the other in the evening), and some geocaching in the afternoon. Our morning Festival walk was a circular walk from Yarmouth to Freshwater and back (broadly following both sides of the Yar Estuary). We had no prior knowledge of the route beforehand, and it was only part-way through the walk we realised our planned caching was on the same path. The focus of the Festival walk was Farming on the Isle of Wight. The leader pointed out different types of crops, different farming systems and talked of the problems of being an island. For example, there is no abattoir on the island, and the cost of transport to the mainland, makes any produce less price competitive against mainland prices. Many farmers are diversifying, enabling small pockets of land to be better capitalised. Our geocaching afternoon started at Freshwater Bay. Or more accurately in it ! Stand a few yards to your right and estimate the cliff size ! Our first target was an Earthcache based on the cliffs rising from the bay. However the position where one had to estimate heights, strata levels was on the beach. 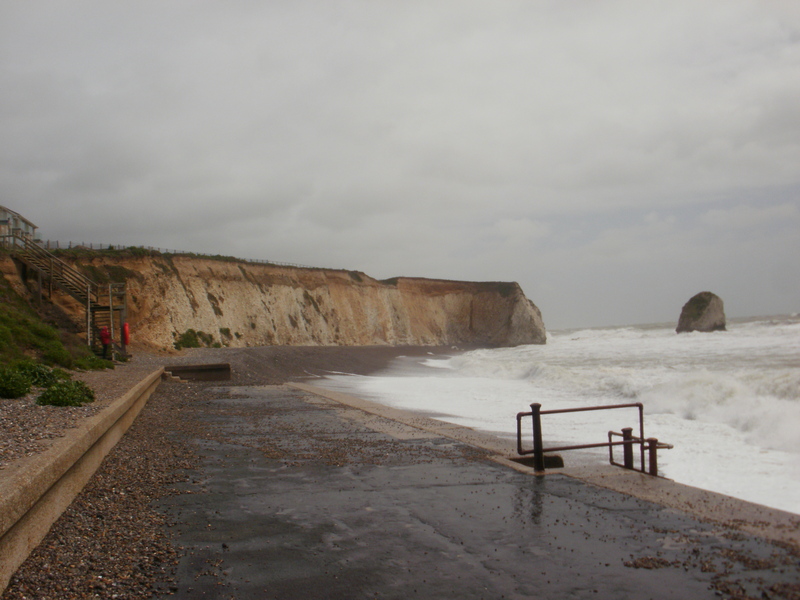 Blown onshore by gale-force winds. We were wet just standing on the promenade. Fortunately the answers we submitted were accepted. Our next few caches were drive-tos. 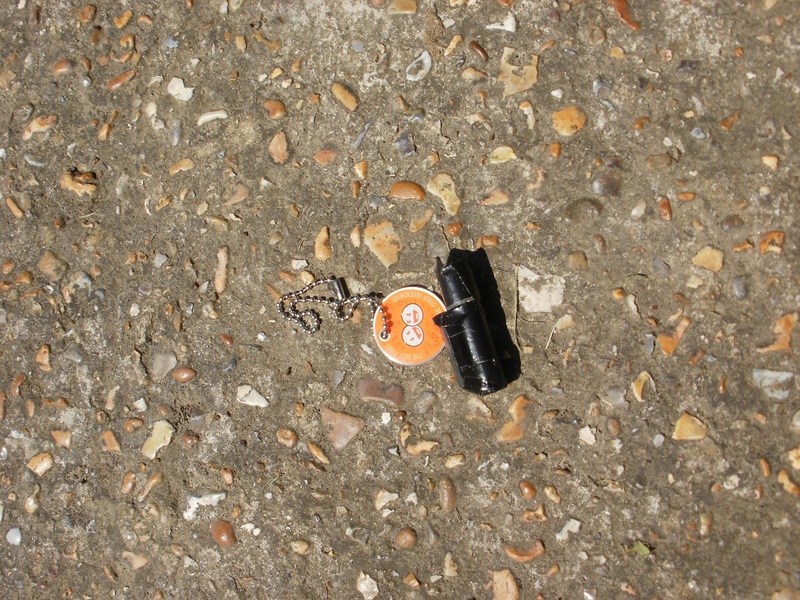 High on the coast road, just outside Freshwater Bay was a simple cache and dash. But the gale-force wind meant we struggled just to open the car door, and when we did find the cache it needed both sets of our hands to prevent the contents being blown away. 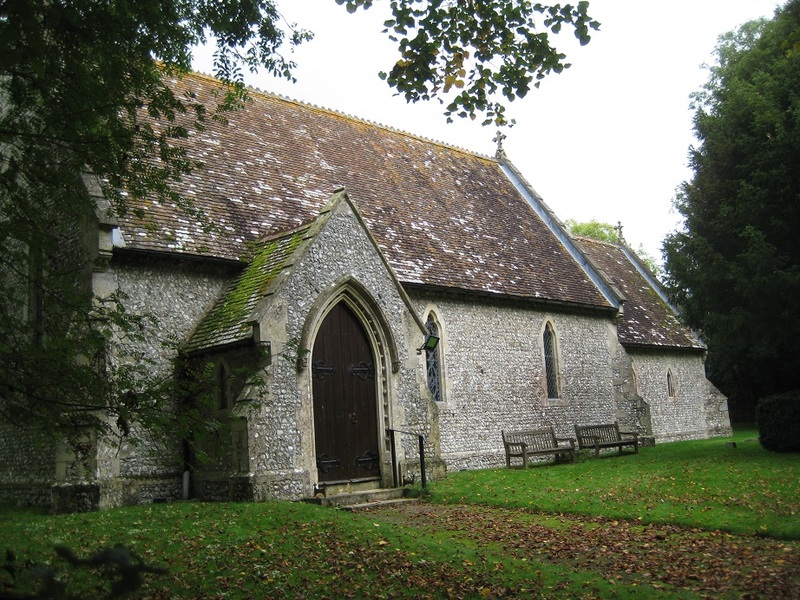 We retreated to the village of Freshwater, and undertook a 5-stage Church multi. Had our brains been blown out by the wind ? Were the co-ordinates really out ? Either way we failed to find too many of the stages to make the final co-ordinates work. This is not the first time we’ve not completed a large multi… we really must improve ! 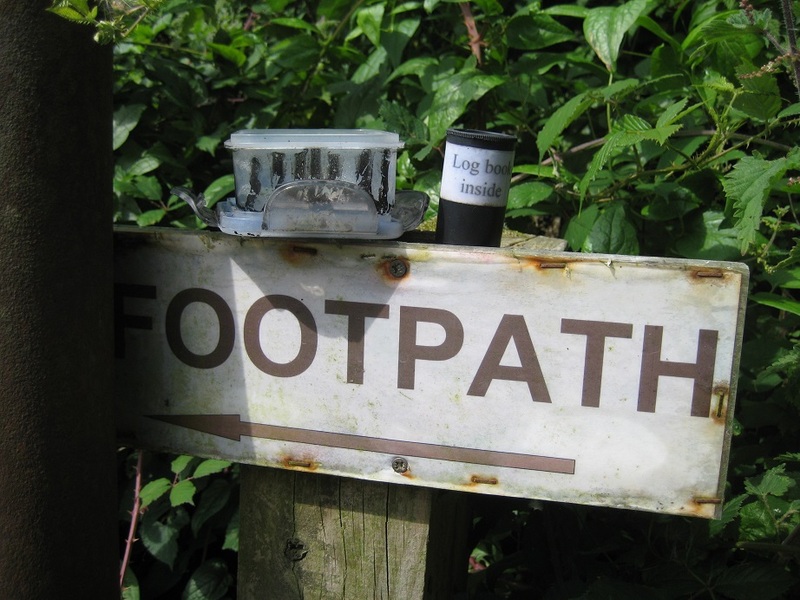 Our final caches were on a familiar footpath … from the morning’s walk. Two simple finds to restore confidence to our wind-tossed bodies ! After a quick meal break we went on our last Festival walk. A Ghost walk. In former times, the site had been a monastery, a manor and thriving village. These historic venues formed the basis of the ghosts, and unexplained premonitions, which were vividly brought to life in our 2 hour ghost walk. Many of the scenes were acted out by three students, but it was one of those nights when things went a little awry. Axe-heads broke, cowls were blown off, music left playing a bit too long. We’re not sure it should have been funny.. but as entertainment – it was different !